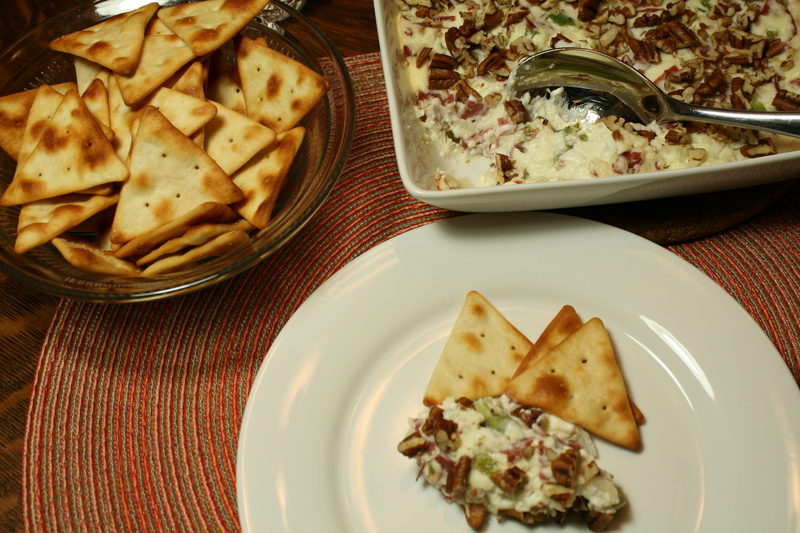 Here are some snacks from past posts to make and enjoy at your New Year’s Eve party. Have fun and stay safe!! 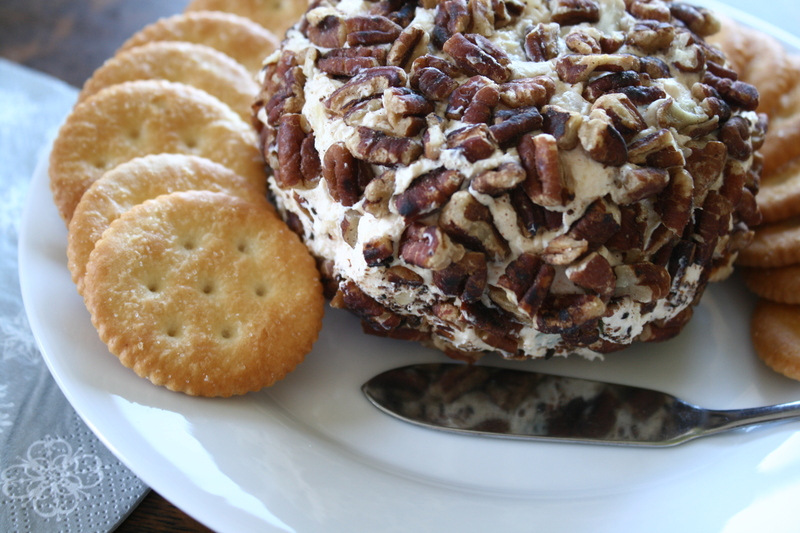 Here is a great snack for New Year’s Eve. Actually, this snack would be great any night this winter in front of a roaring fire, in front of your favorite movie, or binge watching your favorite TV series. This recipe comes from Jamie Oliver and his wonderful Christmas special from a few years ago. You can find the original recipe here. 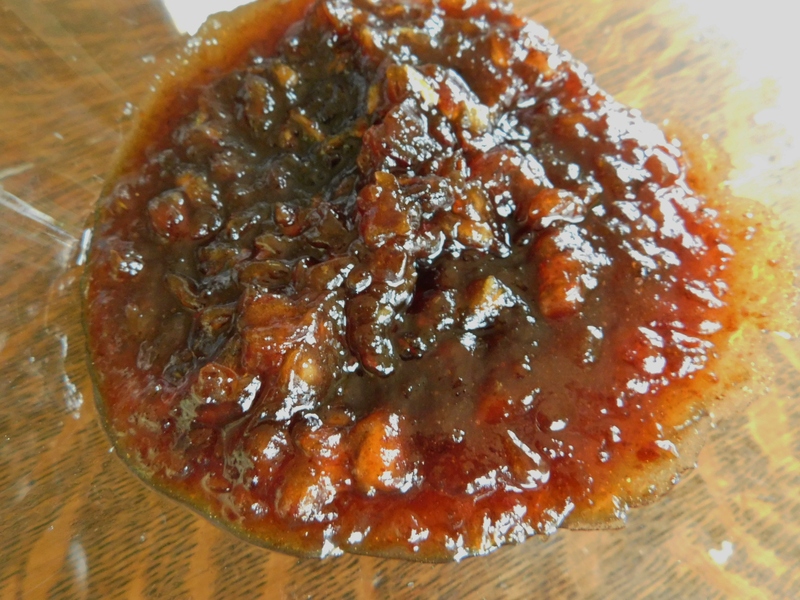 I made this Spiced Sugar as soon as I saw it, gave jars away to family and friends, and have kept the recipe to make again when my supply of this delicious condiment is gone. That day has come. 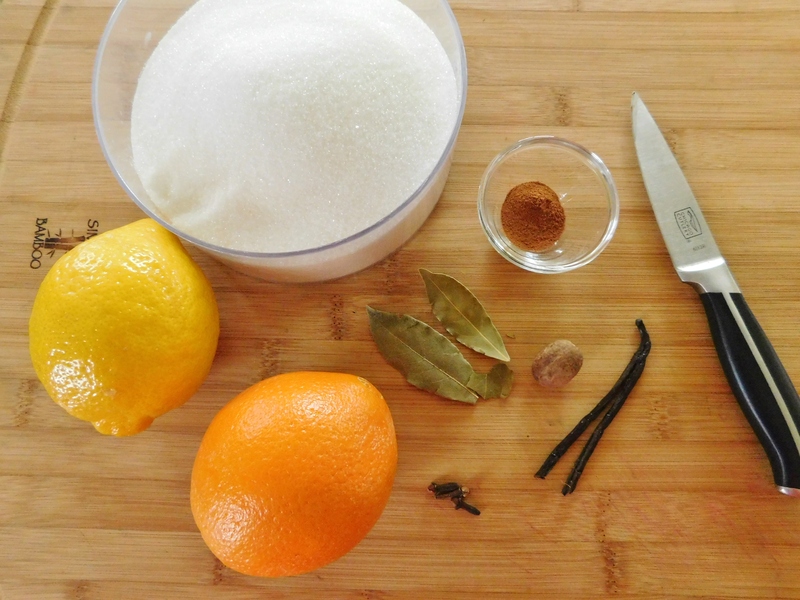 I’m all out of the wonderfully fragrant Spiced Sugar and I desperately need to make more. 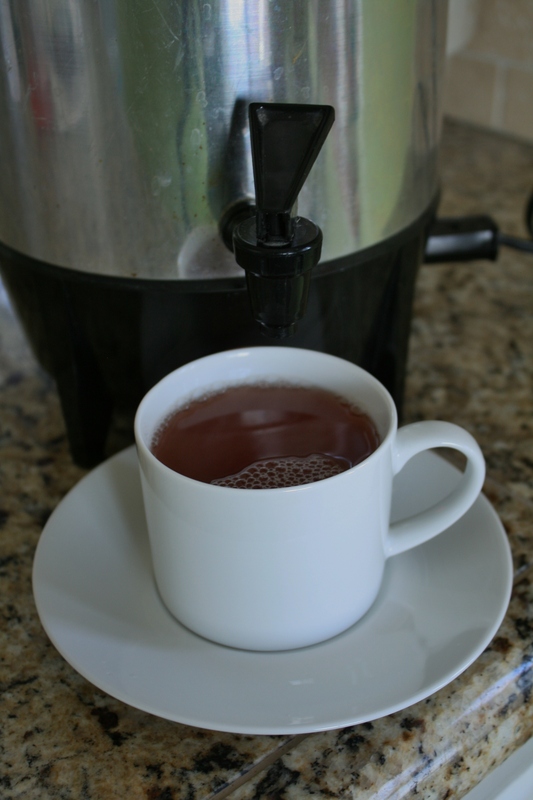 I’m hooked on this stuff – it’s amazing! The sugar is great on popcorn and it’s such a great snack. The original recipe I used was printed from the Jamie Oliver website, so I’ll just type the recipe out here. Whiz again until mixed together. 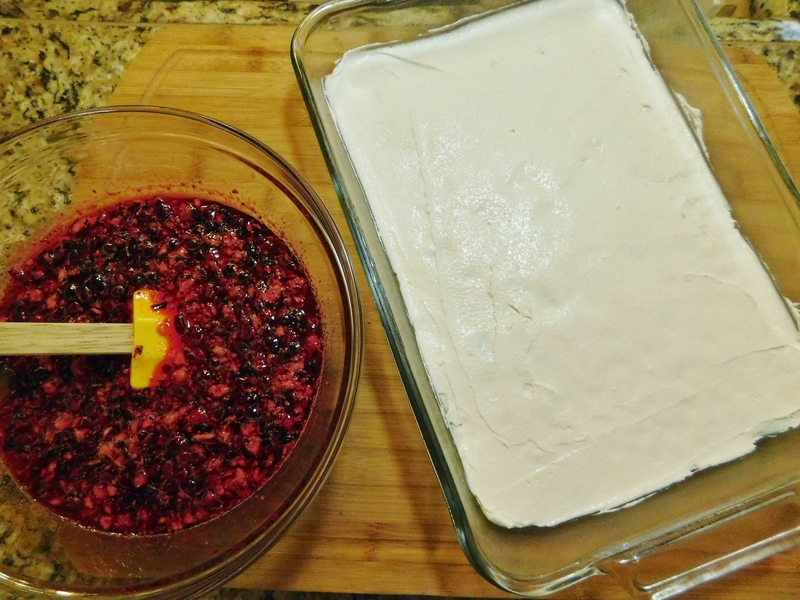 Since it’s pretty moist, put mixture onto a baking tray and spread out evenly to dry for a few hours. 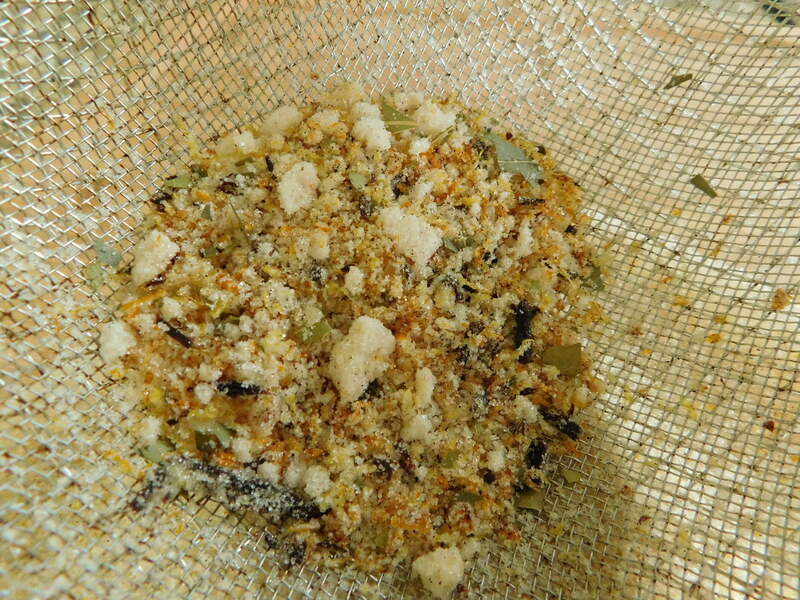 Once it’s nice and dry, sieve it to remove all larger pieces of spices. 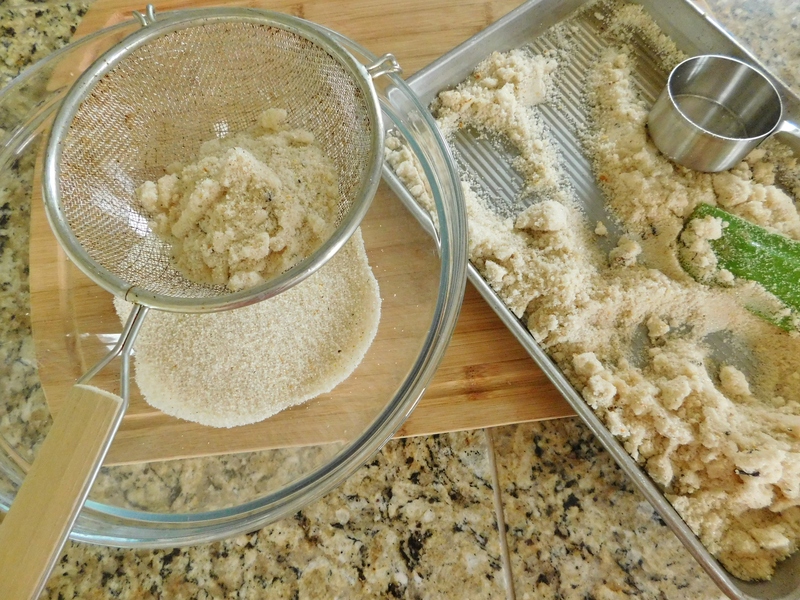 Discard what’s left in the sieve, then put spiced sugar into an airtight container. 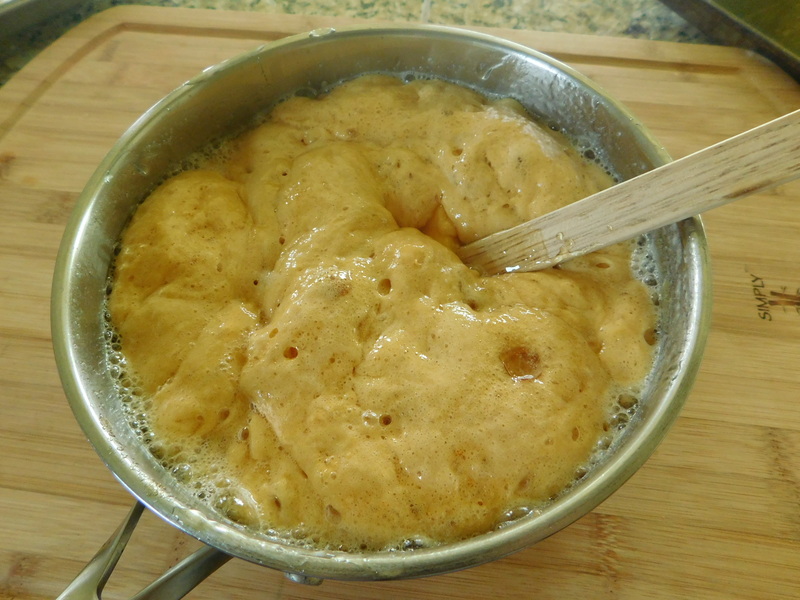 Melt oil and butter in a large pot or dutch oven with a lid. Cover with lid (if you don’t, you’ll be sorry!). 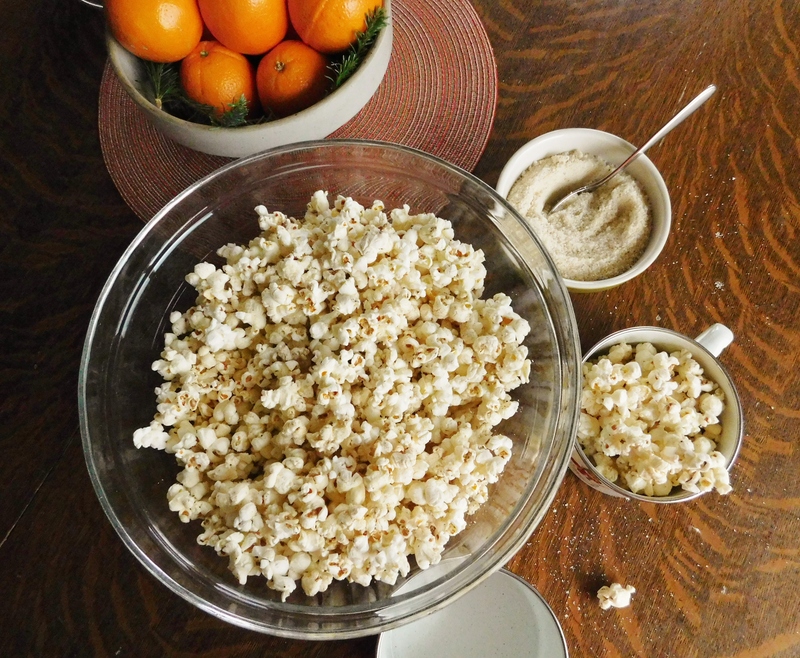 When popping stops, put popcorn into large bowl and immediately sprinkle on the spiced sugar. The ingredients are so unbelievably fragrant. I just took my time making it and enjoyed every heavenly moment of it, breathing deeply and inhaling all of the spicy goodness. 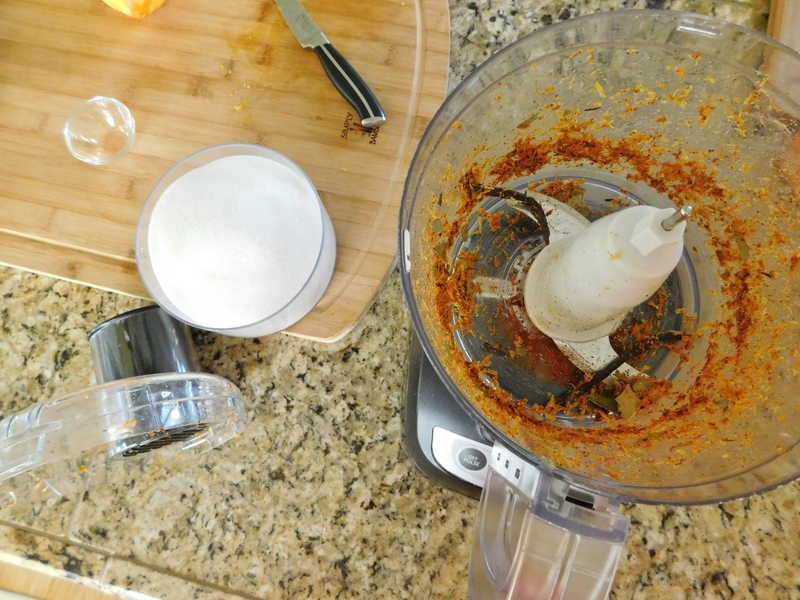 The food processor really does a good job pulverizing and mixing all of the spices and sugar. I let the sugar sit for at least 2 hours and it definitely got drier and crusty. After using the sieve, the leftovers would be good in a simmering potpourri or just sitting in a pretty bowl. It just smells so good! Here is the final, beautiful product. Isn’t it pretty?!! Put in jars it makes a wonderful Christmas gift. I don’t think you could use air popped popcorn for this because it’s too dry. 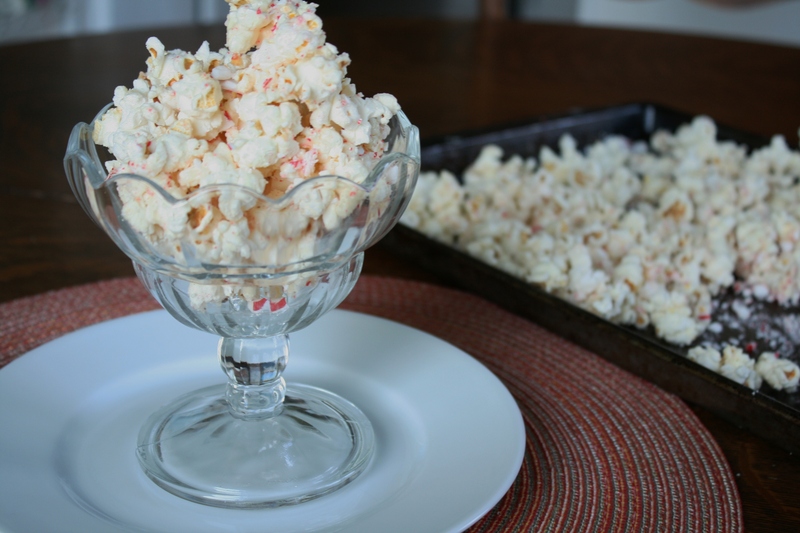 You’d have to add something to keep the sugar from totally falling off of the popcorn. 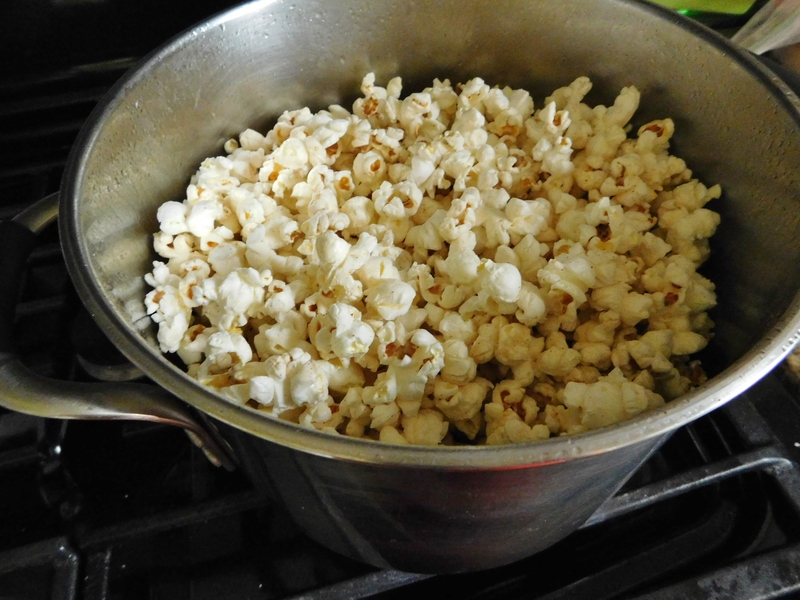 Making popcorn in a pan is the best anyway. 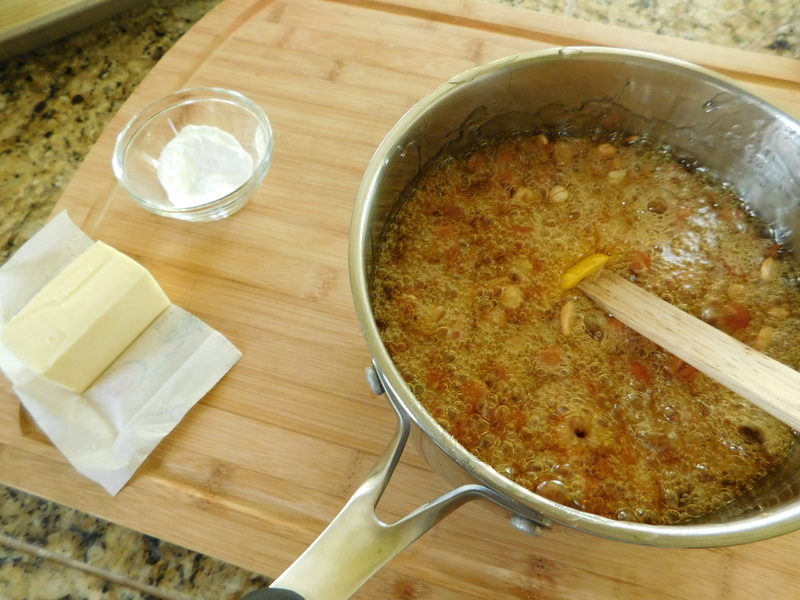 If you wanted it to really be special, a drizzle of melted butter before sugaring wouldn’t be out of the question. 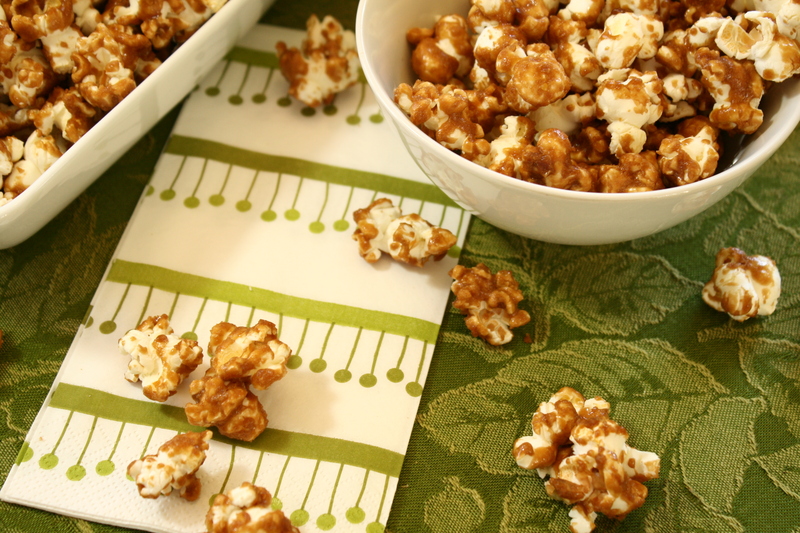 Here is the beautiful spiced sugar popcorn. Wow. 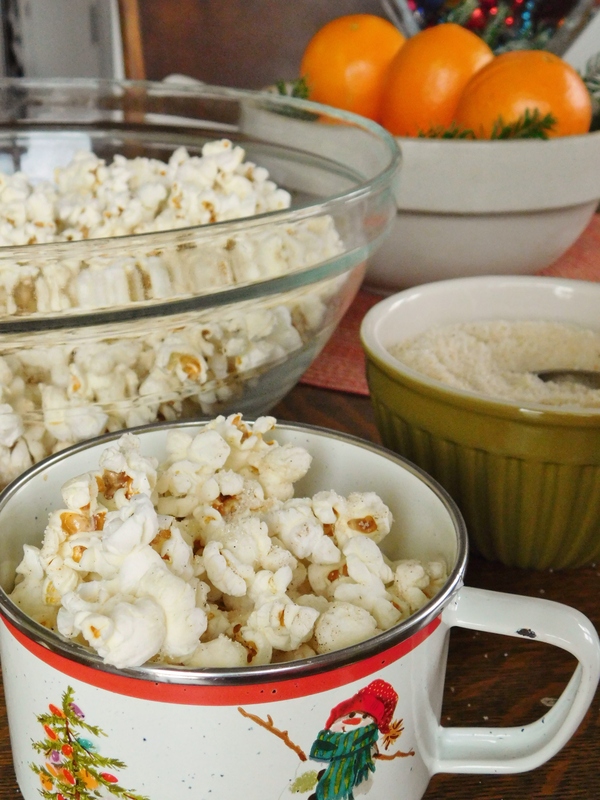 You’re going to want to just keep on making popcorn. Go ahead and make several batches. This sugar is good on anything: oatmeal, cereal, on top of cookie frosting, on top of cakes or muffins, and especially on hot buttered toast. The list could go on and on. 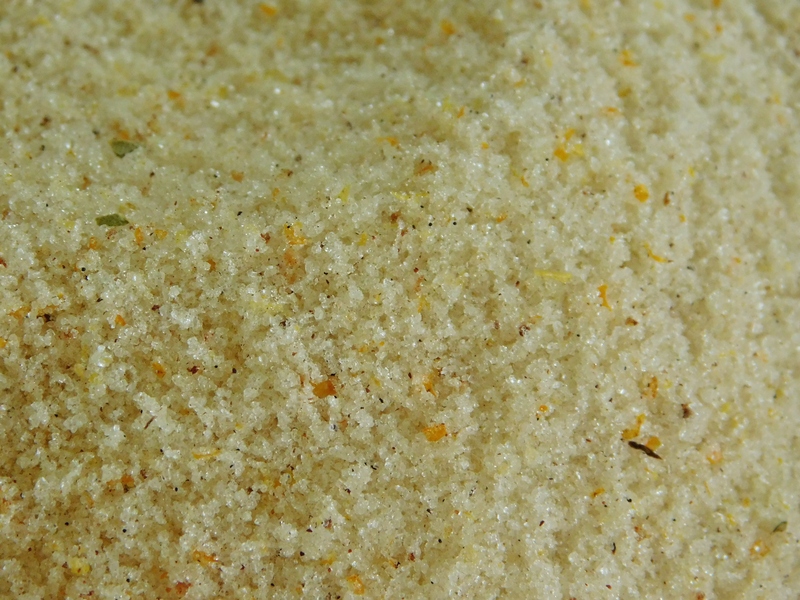 You have to make some of this delicious, multi-use, very addictive spiced sugar. 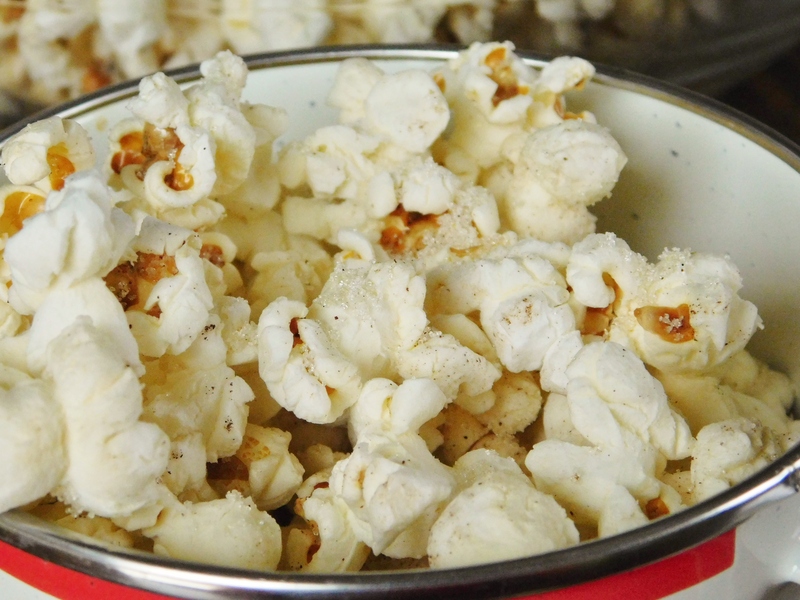 You’ll find a million uses for it – if you have any left after the many batches of popcorn you’re going to want to make. Don’t say I didn’t warn you. Wishing you peace and a very Merry Christmas! I’m sharing one of my favorite Christmas photos today. 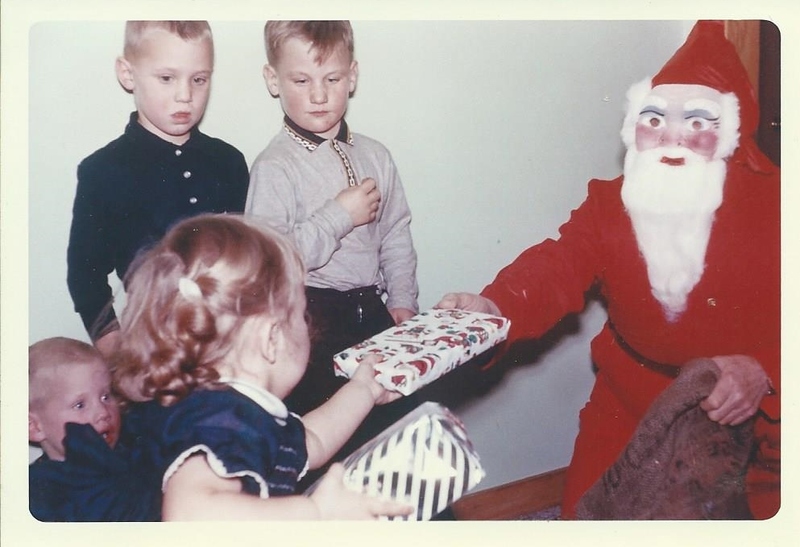 This is me when I was 3 and Santa with the mask – that’s my Grandpa. I’m shocked that I actually took the present from him because I was always so scared of Santa. Maybe it had something to do with the creepy mask! I’m sure he wore it because if he didn’t have a mask, I’d know him, but wow. This was taken at my other Grandma and Gramp’s house and those are my cousins with me. Christmas there was always a lot of fun and total chaos! 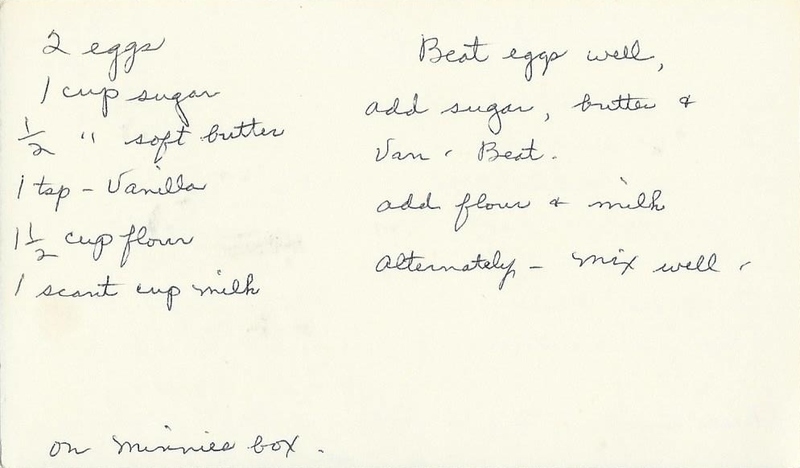 The recipe for today comes from my other Grandma. She loved to cook and loved to have all of us at their house for the holidays. 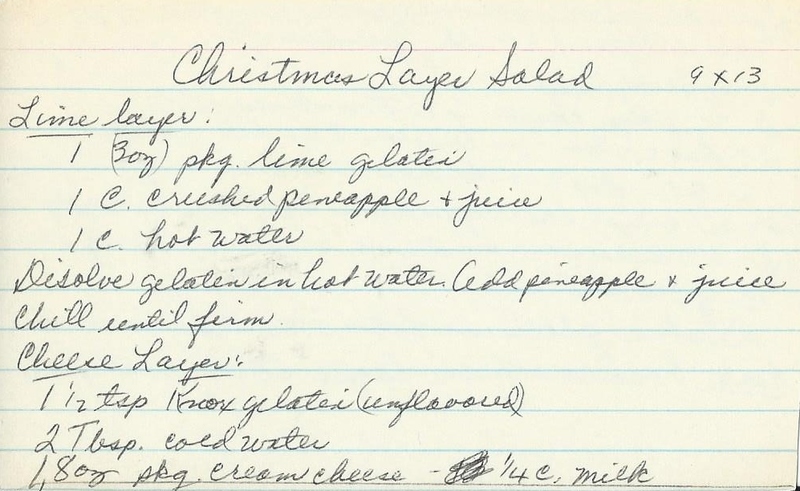 I remember her making this Christmas Layer Salad once in a while, and I remember that it was very good and very festive. It looks more complicated than it really is, but it does take some time. Each layer is firmed up before adding the next. This really is easier than it seems! Use a 9″ x 13″ pan. It’s helpful to read through entire recipe before starting. 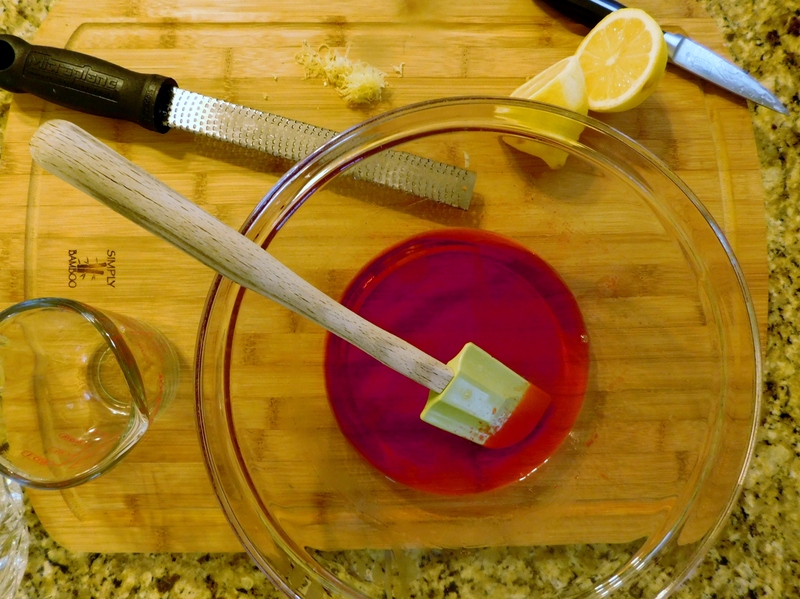 Dissolve 1 1/2 teaspoons Knox Gelatin in 2 Tablespoons cold water. Spread over firm lime layer. 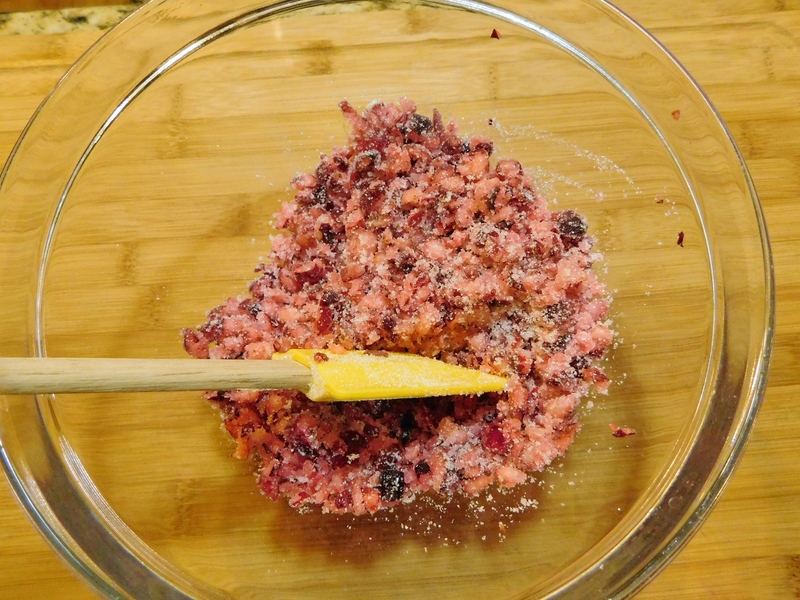 Add 3/4 cup sugar to 1 cup ground cranberries. Let sit for several hours (I did this first before anything else so it had time to sit, but you could even do it the night before). 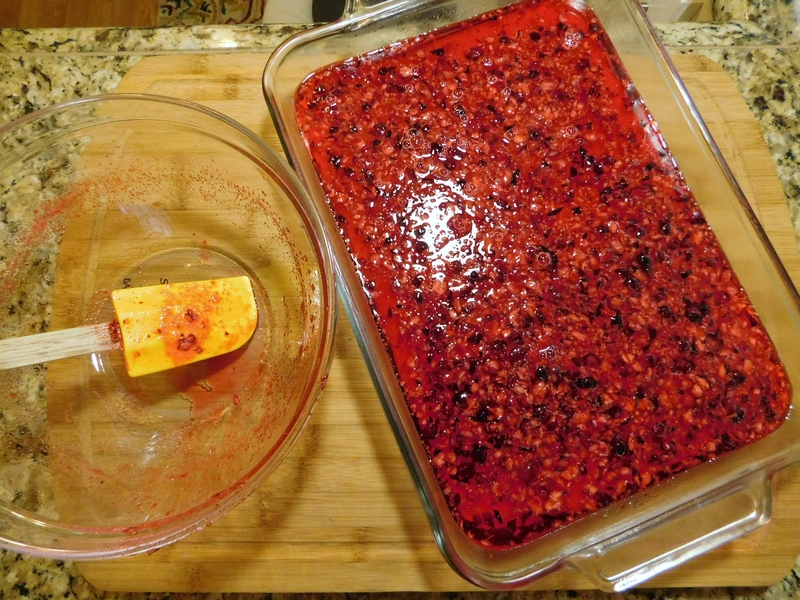 Prepare 2 – 3 ounce packages of raspberry or strawberry Jello according to package instructions. Pour over cheese layer and chill until firm. 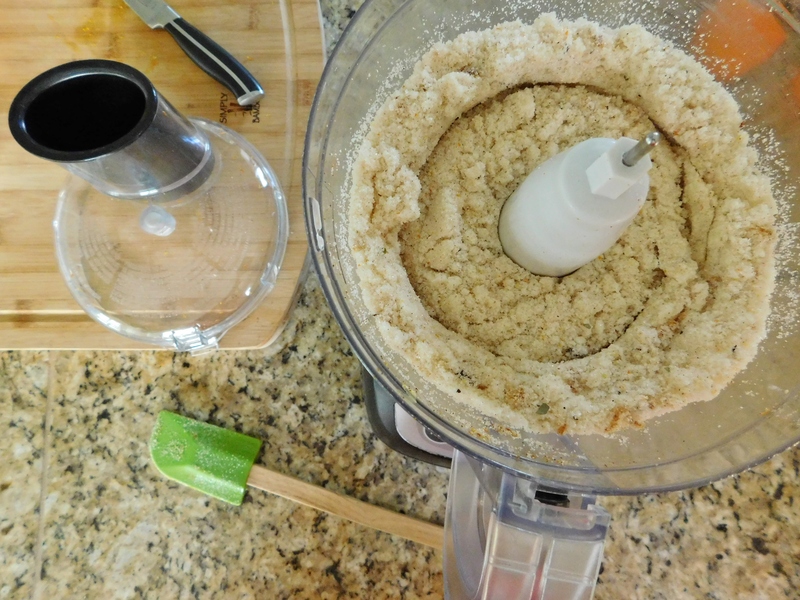 The first thing I did was get the cranberries ground (I used my food processor) and mixed with the sugar so it could sit for a couple of hours. 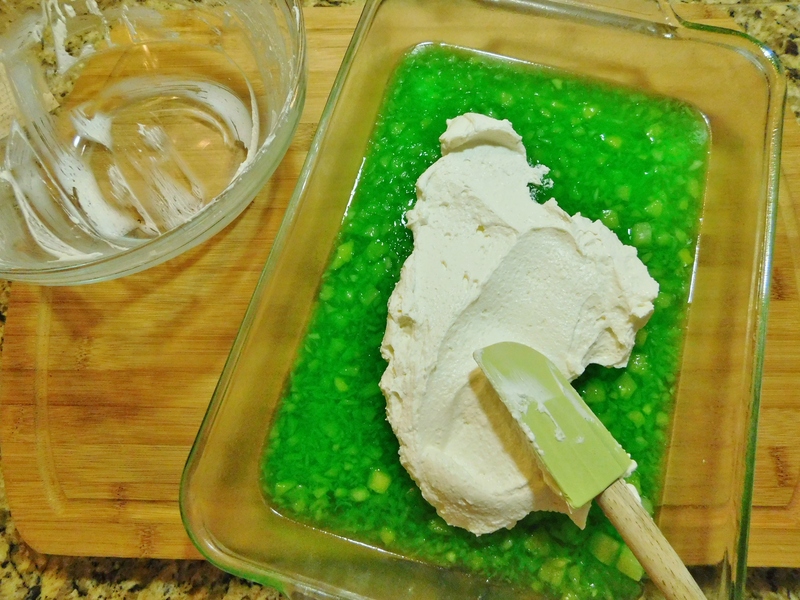 Here we go with layer #1 – mixing the green layer and getting it into the refrigerator to firm up. Next is layer #2 – mixing the middle white layer, spreading it over the green layer, and into the refrigerator to firm that one up. The final layer #3 – mixing the cranberries with the strawberry Jello, pouring it over the middle white layer, and into the refrigerator to firm up. Here is the salad ready for the refrigerator. I was surprised at how fast the layers set up. This was overall, pretty fast to make. Here is the final salad – so pretty! You can see the three separate layers – so festive! This salad is absolutely delicious! 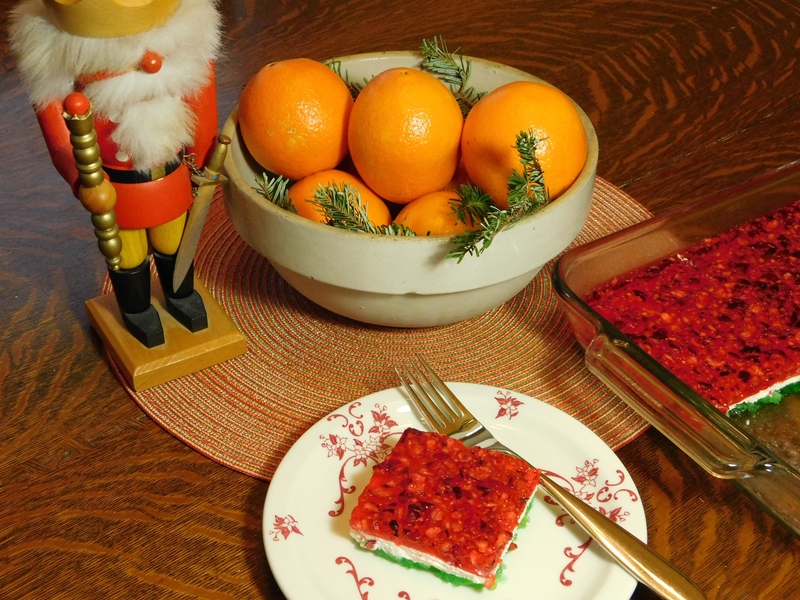 The Jello layers are “plenty sweet” but the middle creamy layer tones that down and makes it so good! 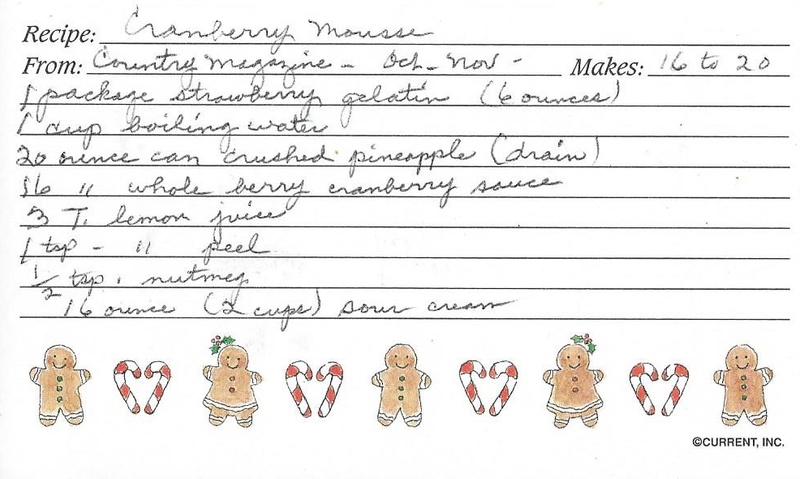 My other Grandma loved Christmas and loved to cook. This has a lot of steps, but is really easy and quick to make. I can see why she wanted me to have this recipe. It’s just about the most festive Christmas salad I’ve ever seen! I just had to share this photo today. The date on the bottom says 1949 and I absolutely LOVE this one! 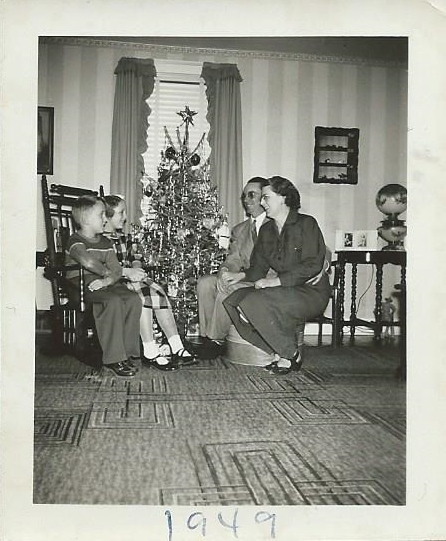 Love the wallpaper, love the carpet, love the beautiful little tree, love the way grandma and grandpa are looking at my mom and my uncle! They actually look like they were having fun taking this photo, so it seems like a more casual photo than the usual formal ones. You can almost hear Bing Crosby singing on the radio!!! My mom still has the lamp in the back corner with the round globe. There’s my mom in the bobby sox again! They look like they’re straight out of the move “A Christmas Story”! 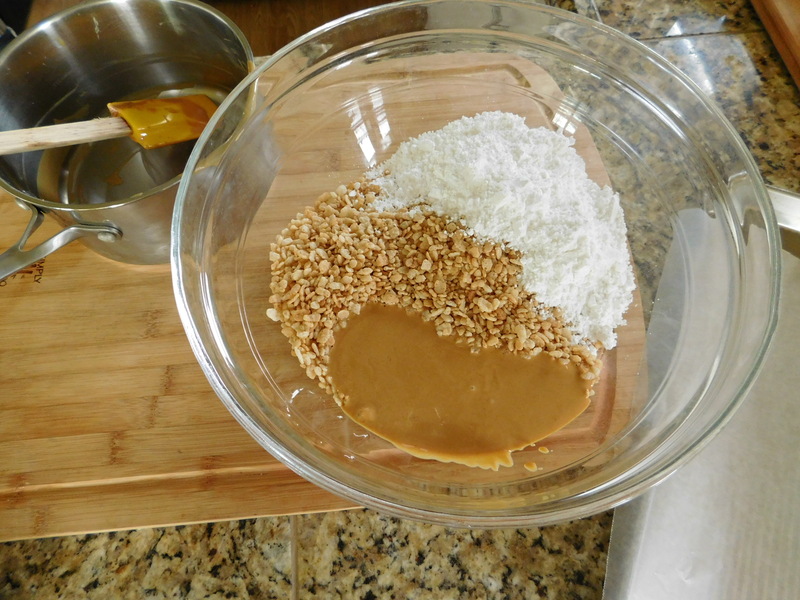 The recipe for today wasn’t originally called Peanut Butter Snowballs. 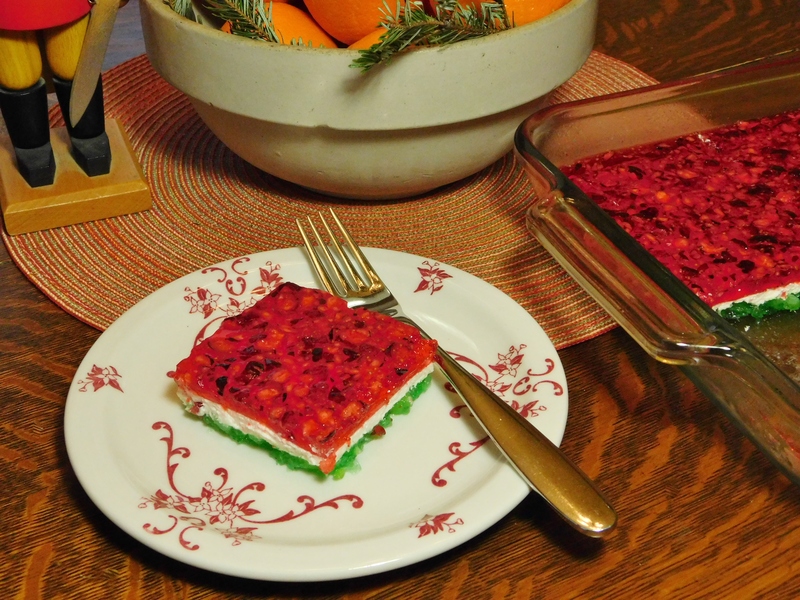 Back when Grandma first made these for us, they didn’t have a name and she had colored the almond bark green, so me, my dad, and my sister, in our infinite wisdom and junior high humor, called them “Goobers”. It didn’t seem very appropriate to keep that name. I decided not to color the almond bark for this batch, keep them white, and rename them Peanut Butter Snowballs. I don’t have her original recipe anymore, so I’ll just type it out here. 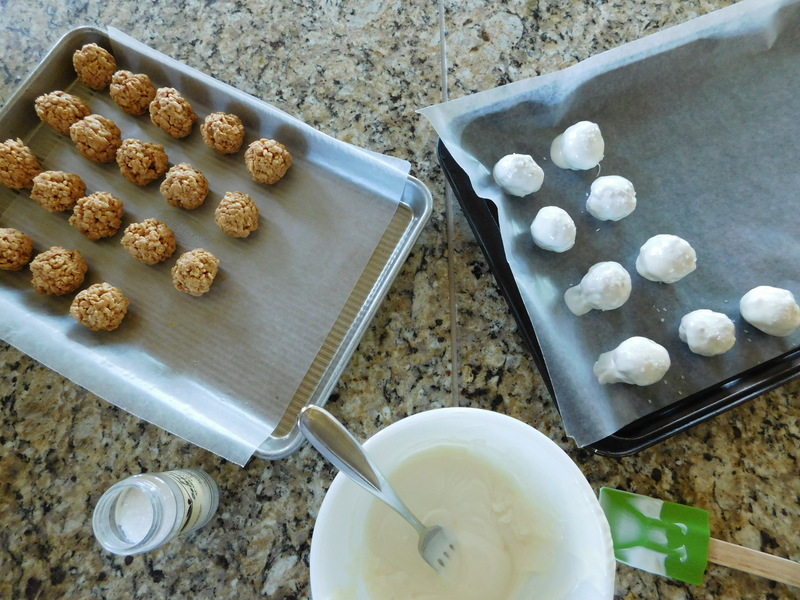 Make into balls and put in refrigerator for 1 hour or more or overnight (I also put the bowl into the frig for about 30 min just to cool if off a bit before rolling). 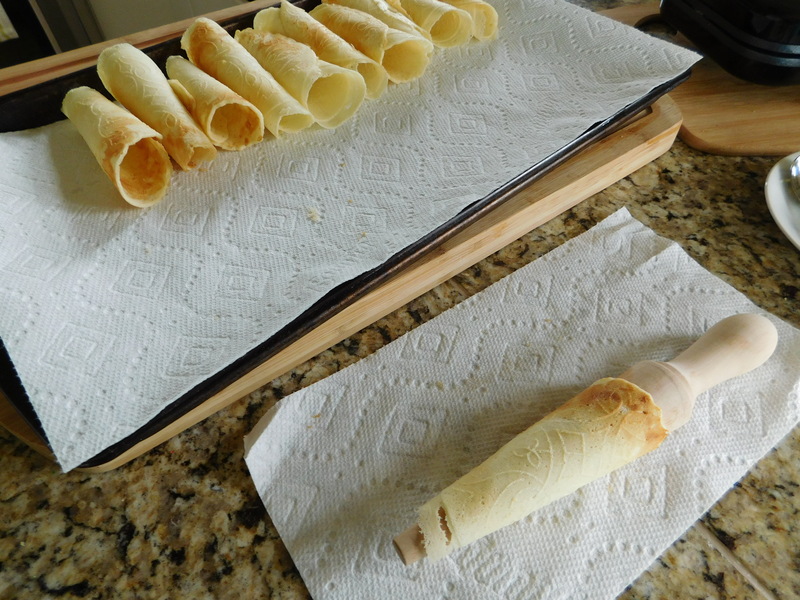 Roll in melted almond bark (can use food coloring). 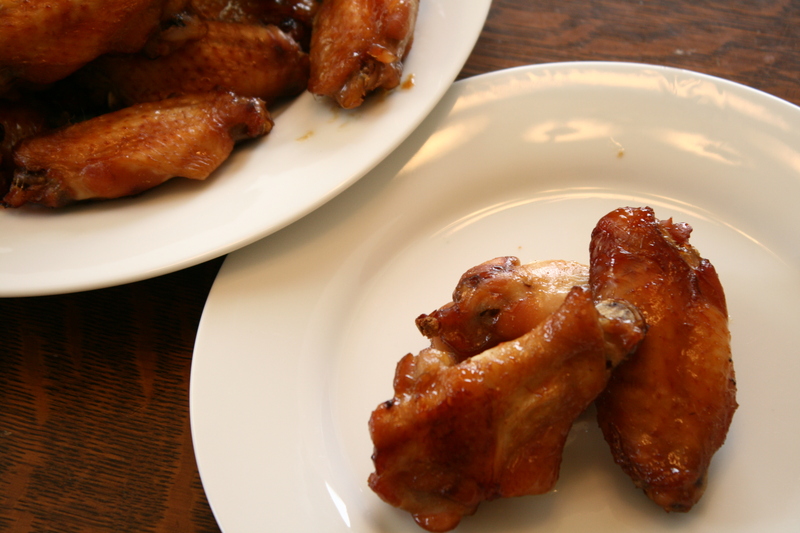 It’s a pretty simple recipe with just a few ingredients, but man, are these good! I’m sure that as usual, I made them way too big. I found that when rolling the balls, using a light hand helped the balls stick together better. 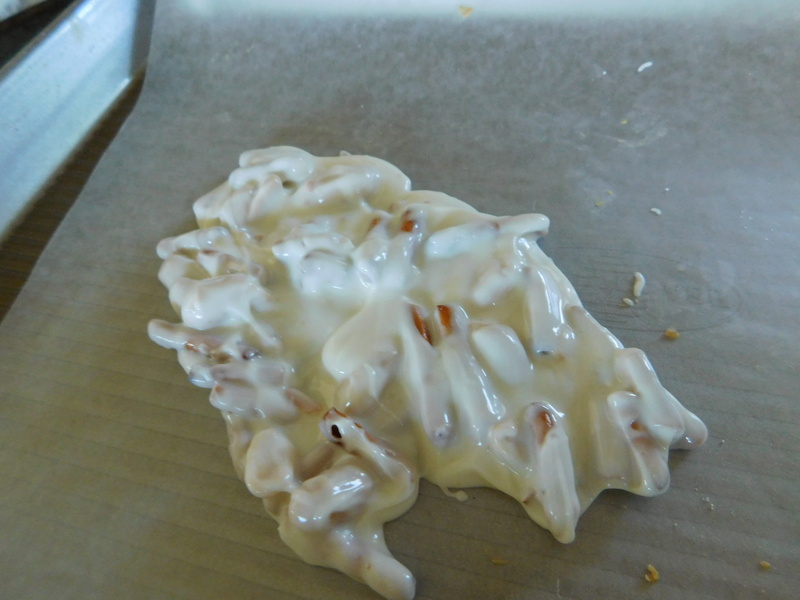 There is always a bit of almond bark left over whenever you make candies this time of year. I just throw in some peanuts and some crushed up pretzels, let it cool, and give it to the family so they keep their hands off the real Christmas cookies! I tried a few different kinds of sprinkles until I decided on using the large white sugar. They look like ice crystals. These are great, but I would try to make them smaller next time. These are – plenty sweet – but they make a great gift or addition to your cookie tray. 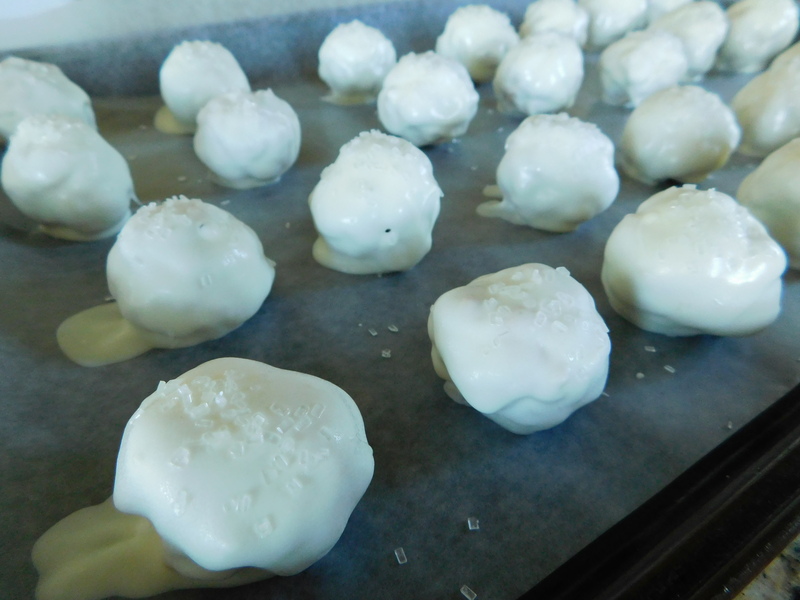 They look like pretty little snowballs! 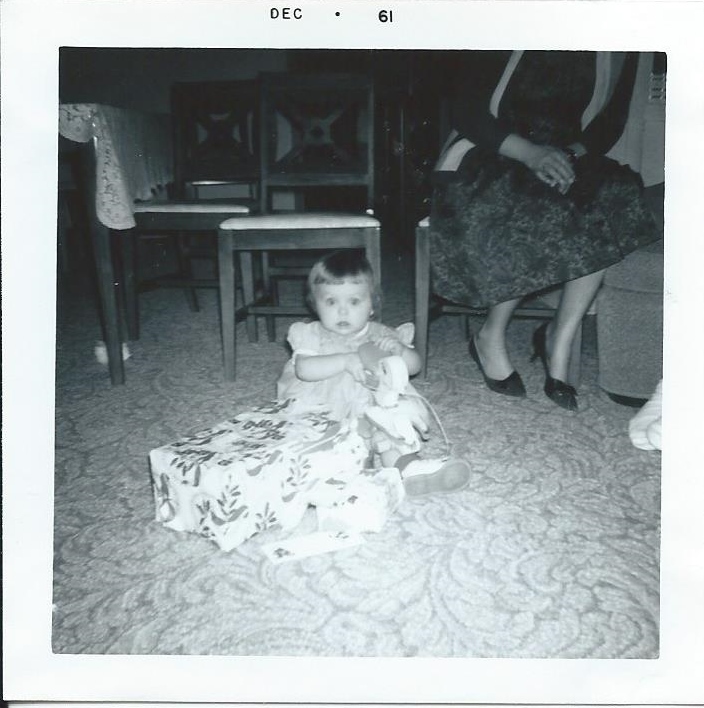 Seeing this photo of me at 1 year old reminded me so much of Grandma and Grandpa, the farm, and holidays spent there, that I just had to share this one, too. Holidays were always spent with family and a lot of conversation, family stories, laughter and love swirling around the room. This photo is so funny! Can you say “presents?!! !” Haha! I seem to like the ducky toy enough to ignore the other present that looks like it’s bigger than me!! You can tell by the eyes that I don’t have any idea what’s going on, but I like it!! 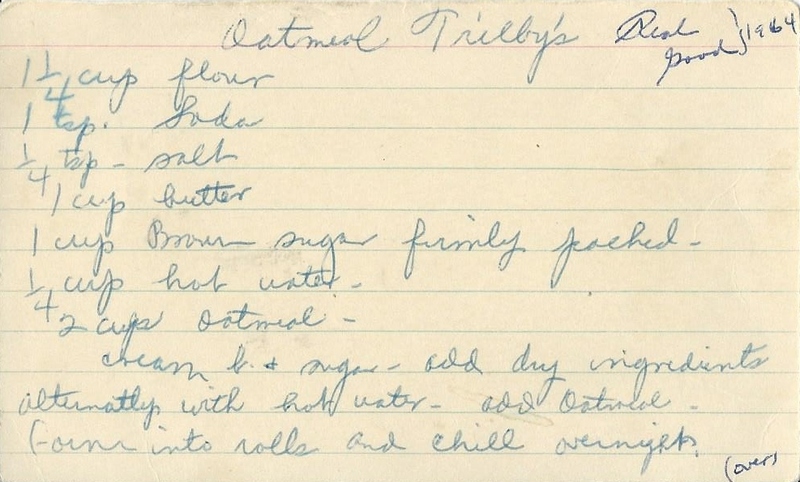 Thinking of Grandma and Grandpa, the farm, and the holidays spent there brings me to another Scandinavian recipe! 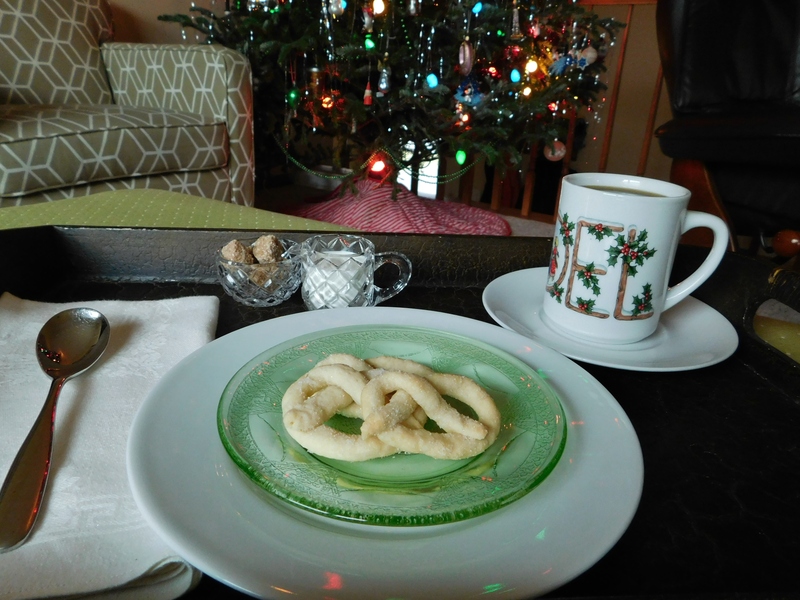 We always have Krumkaka at Christmas and they’re one of my favorite Christmas cookies. My mom has a stove top krumkaka iron that we usually make these cookies on, but this year we’re trying something new. My husband gave me a krumkaka iron for my birthday and it’s ELECTRIC. An electric one is great, but the BEST part about it – it’s a DOUBLE. 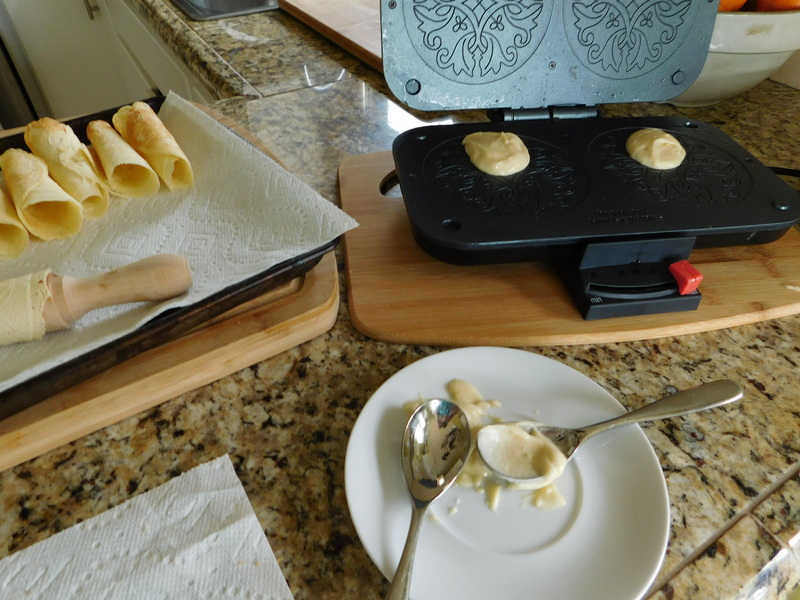 Yes – you can cook 2 at a time!!! That means it goes twice as fast!! 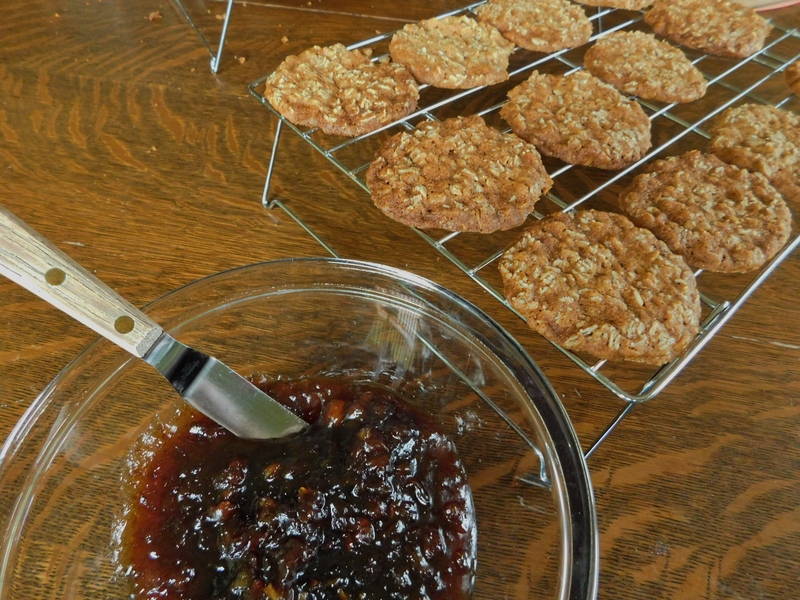 That’s a good thing – a very good thing – because this recipe makes A LOT of cookies. We usually cut it in half and THAT makes a lot of cookies. 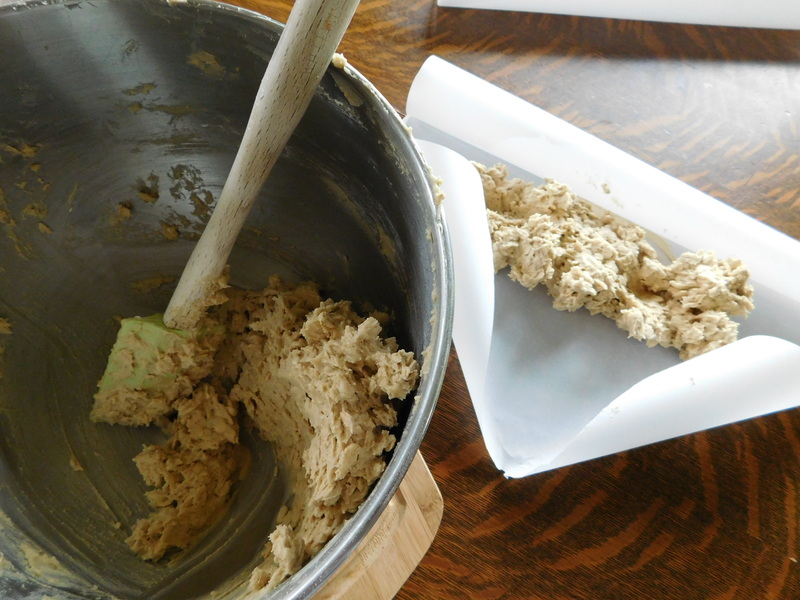 We sometimes have had a Scandinavian baking day (I’ve posted about a couple of those other cookies – Sanbakkelse, Spritz Cookies, Lefse, and Lefse #2) where my mom comes and one or both of my daughters, so the baking of all these cookies goes faster. If not faster, it just seems like it with all the conversation, family stories, laughter, and love swirling around the room. Sound familiar? This card has my mom’s initials on it, so it originally came from her. There was another recipe on the back of the card from someone else, but it’s basically just the front recipe cut in half. But with more vanilla. I used the recipe on the back of the card (the half batch) with more vanilla. 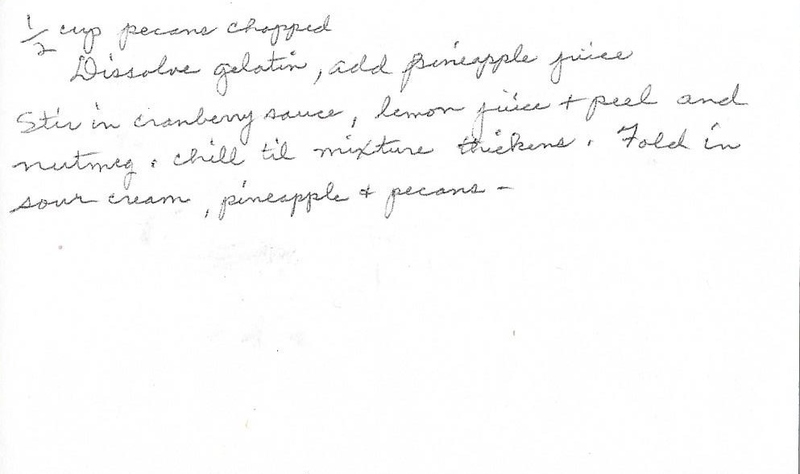 This one has the “Good Recipe” connotation on it! Cook in krumkaka iron half a minute on each side if using stove top iron (I used my new electric iron and it took about 1 minute and 20 seconds to cook. 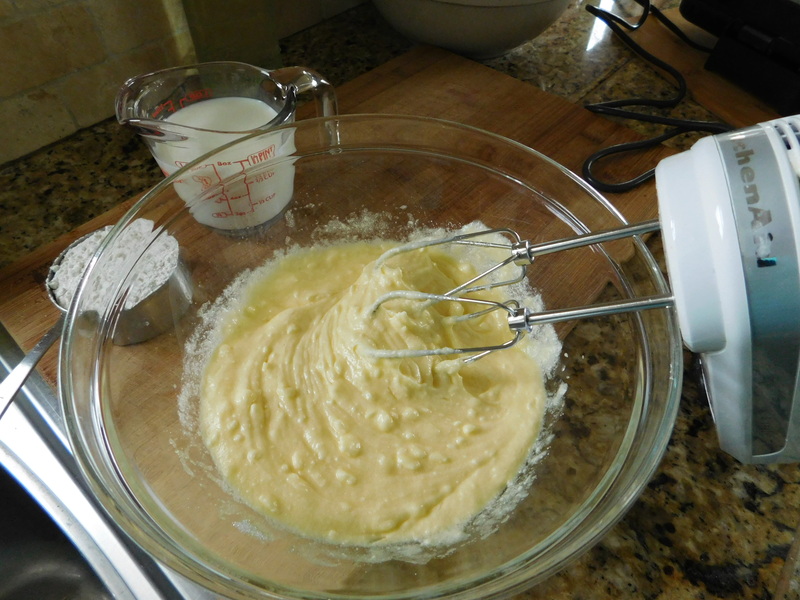 Even if you have softened butter, I’d beat it well when adding the rest of the ingredients so you don’t have lumps of butter in the batter. Yay! Here’s my new electric iron! 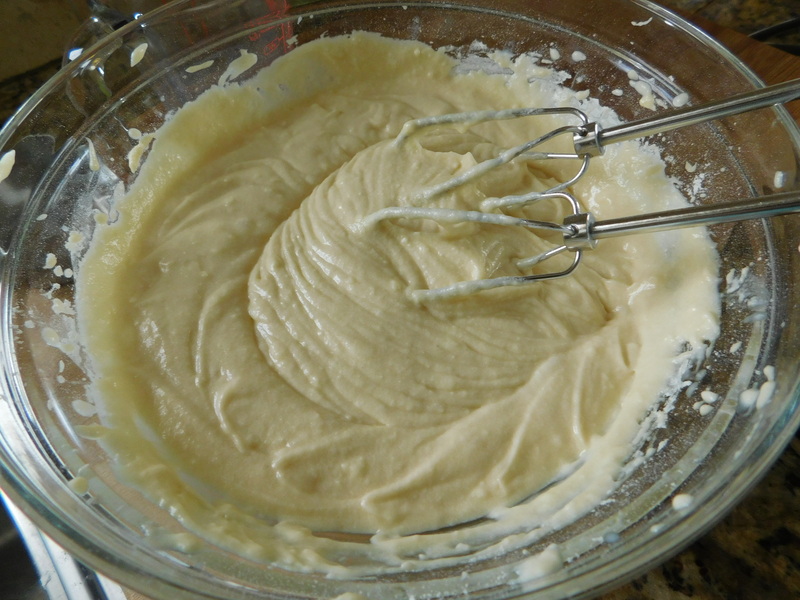 Put about a heaping teaspoon of batter on iron and hold it shut for about 30 seconds when cooking. 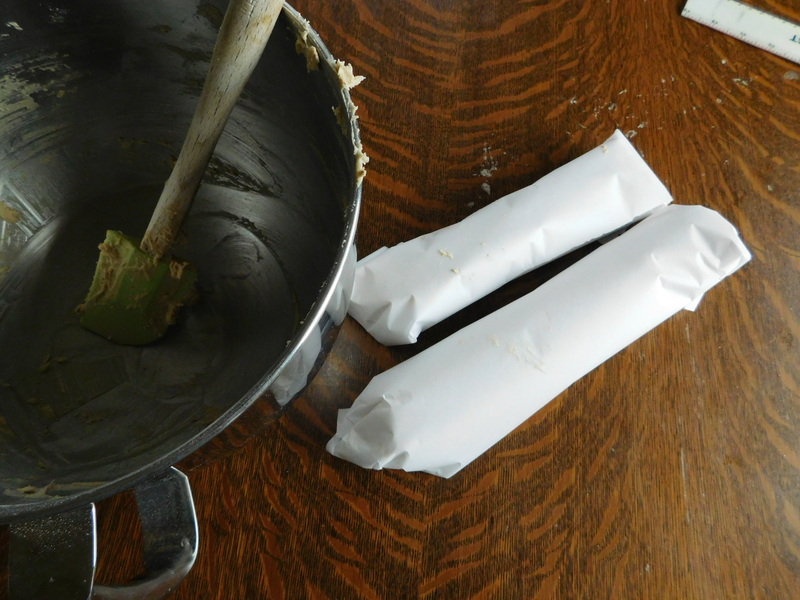 After the cookies are done, remove them from the iron and immediately roll them around the wooden cone that is included with the iron. I’m hoping Santa brings me an extra wooden cone because I found that it would definitely help to have two when cooking two cookies at a time. The second cookie sometimes gets a bit too hard to roll if you don’t stay on top of the rolling thing. I mean, not that you can’t find something to do with those cookies that crack when they sat too long. Someone has to be the taste tester, and luckily, my husband is there with a can of Reddi Wip to squirt into those cracked ones to hold them together and make sure the batch is ok. Hmmm. Maybe there was an ulterior motive involved with this birthday gift. Aren’t they pretty?!! This batch made about 46. The first ones got a bit lighter than I like them to be, but I was still learning how to use the new iron. We’ve since made a second batch and they were better. I’m learning! 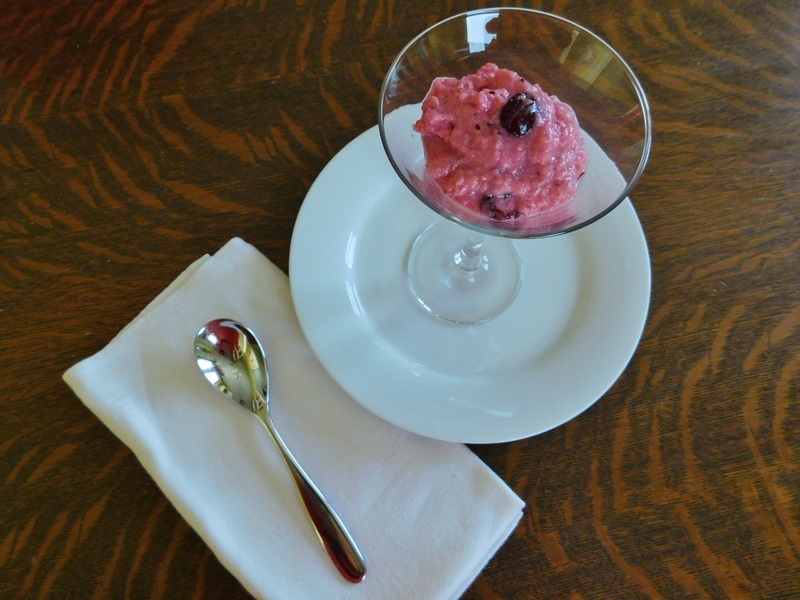 I hope you get a chance to try to make some of these great Scandinavian favorites! Gather your family or helpers, make some memories of your own, and feel the love! 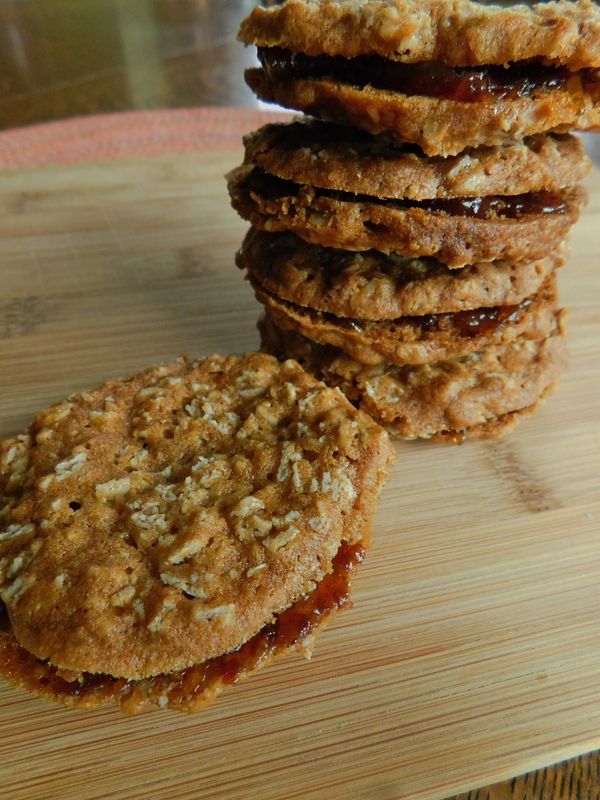 These Oatmeal Trilbys were one of Grandma’s favorite cookies. 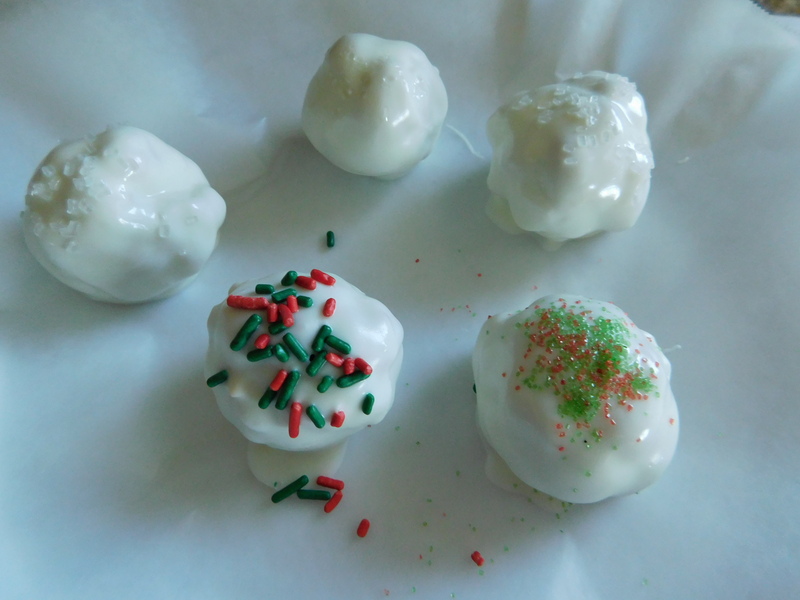 She made them at Christmastime, but I think she made them other times of the year, too, because she always had a container of these stashed in the freezer. This is another one that uses the warmth of dates. Dates must have been a more common ingredients for sweets years ago. They seem very traditional, and the date on the card is 1964!!! 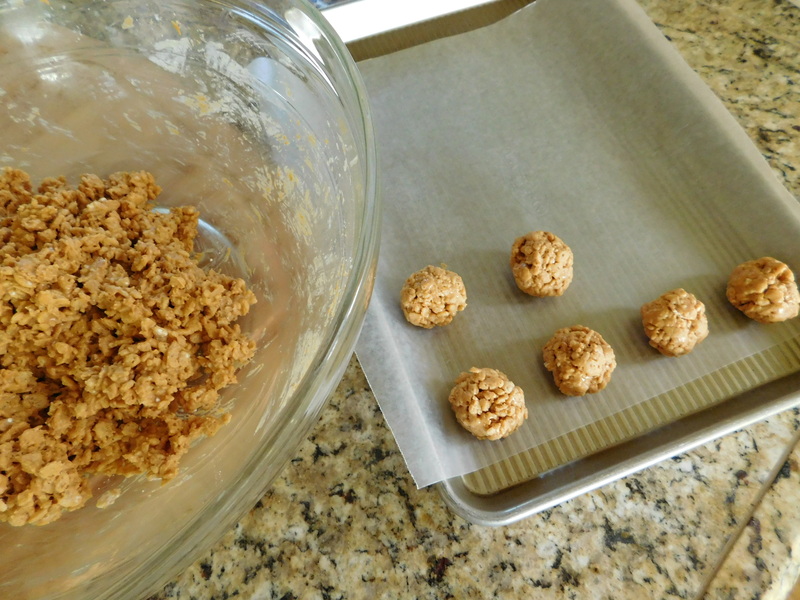 This is how long she’s been making these cookies – since I was this old! Here I am, in front of the old silver tree with blue balls on it. It’s hard to tell which grandma and grandpa’s house this photo was taken at because they both had this tree! I loved to sit and watch the colors change on the sparkly silver tree while the color wheel turned from red to blue to gold. It was mesmerizing and I would sit there for hours – at both houses! Note the “Real Good” connotation here! 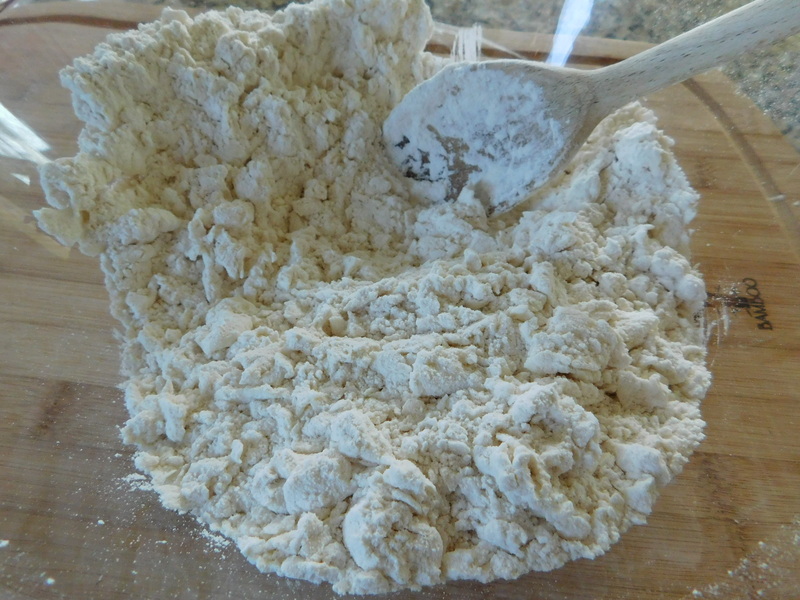 Dry ingredients alternately with 1 cup hot water. Form into logs and chill overnight. Bake at 325-350 for 8-10 minutes or until light brown. Spread filling between two cookies to make a sandwich. I made two logs of dough, but I think they were still too big around. I’d make the logs thinner next time. Pull the logs out of the refrigerator and just slice them before baking. The filling is sweet and thick when cool. The cookies were much thinner than Grandma’s. 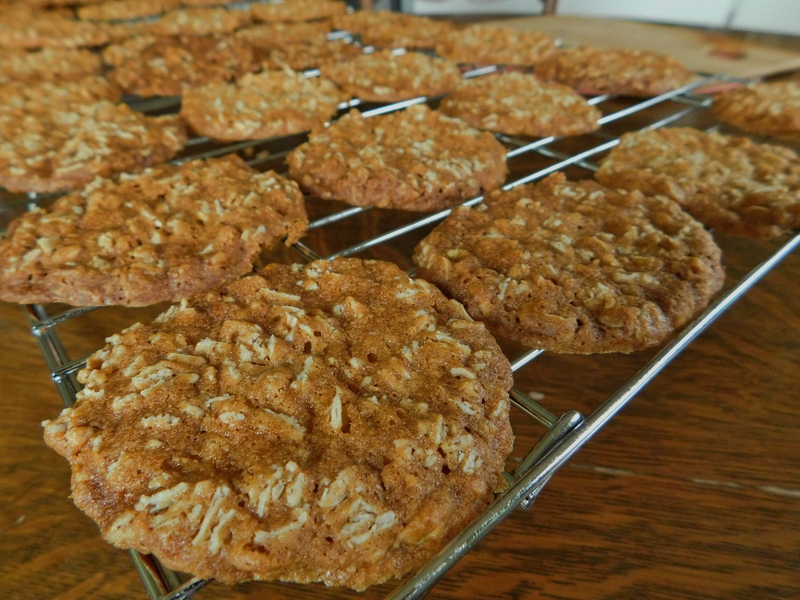 Maybe the 375 temp made them spread more – that’s why I’d try to bake them at a lower temp next time. Time to make the sandwiches! They don’t look exactly like Grandma’s cookies, but they are DELICIOUS!!! Try these traditional, old-fashioned, luscious, holiday sandwich cookies – your family will thank you! They’re very sweet – plenty sweet! Ha! 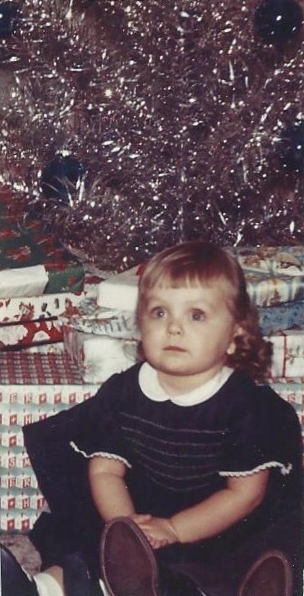 I just had to share this photo of me at Christmas time when I was 5 years old. Here I am modeling a cardigan/tam hat/mitten set that my godmother knitted for me! 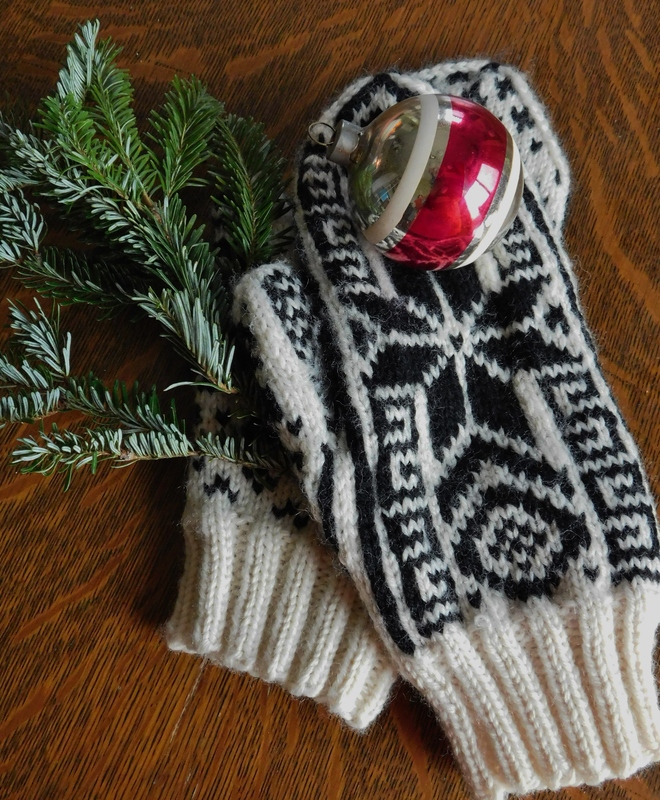 I still have the mittens, but I don’t know where the other pieces went. 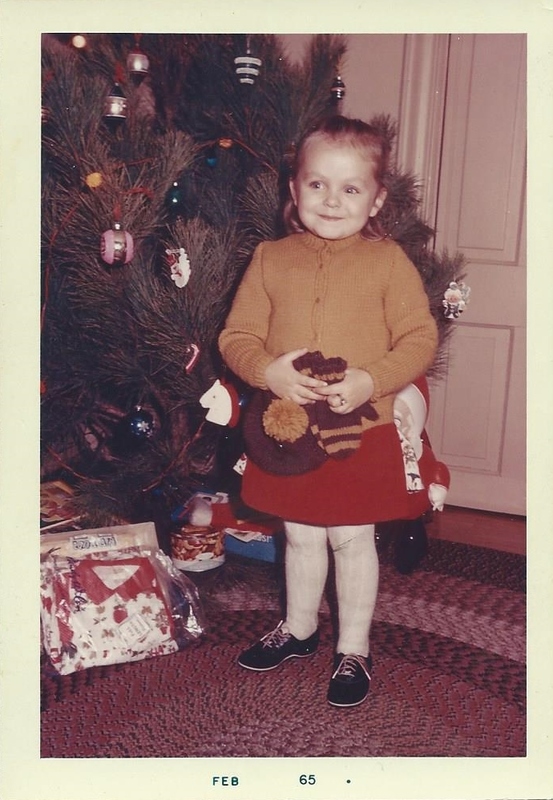 Many of those ornaments on the tree behind me are still on our tree this year. I’m not sure why, but my mom really liked those trees with the long needles (I think they are Norway pine?) and we had those a lot. These days I like a Fraser fir or balsam fir Christmas tree because they smell great and you can get more ornaments on the tree! 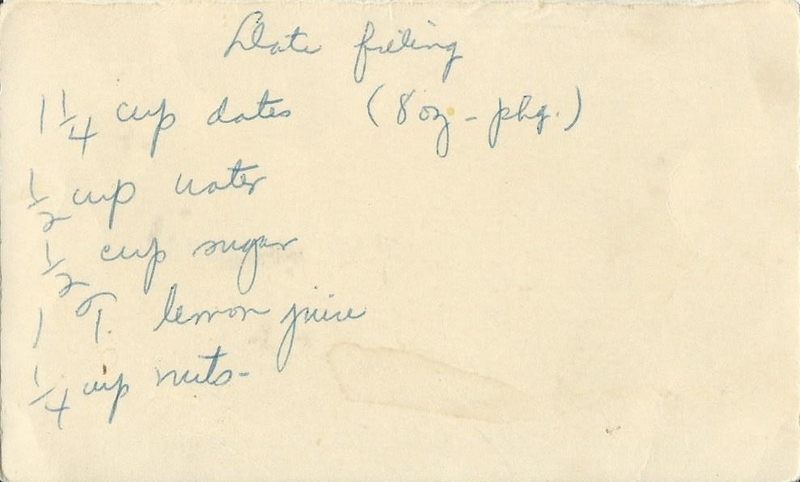 Today’s recipe is one that I never saw Grandma make, and I’m not sure I’ve got it right. This is a newspaper clipping, and it does say “Good” on it, but I don’t know about these Swedish Kringlor. Unless I made them too thin, I’m not sure these turned out. Oh well, our goal is to try them all. I went to the internet to see if there were any similar recipes and there are NOT, not that I could find, anyway. 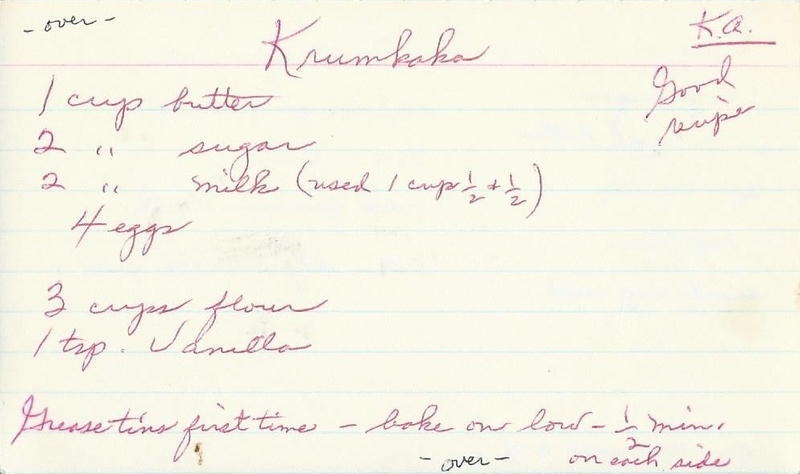 There are a lot of recipes with this name, but they’re not the same ingredients or cookie. So I was on my own. 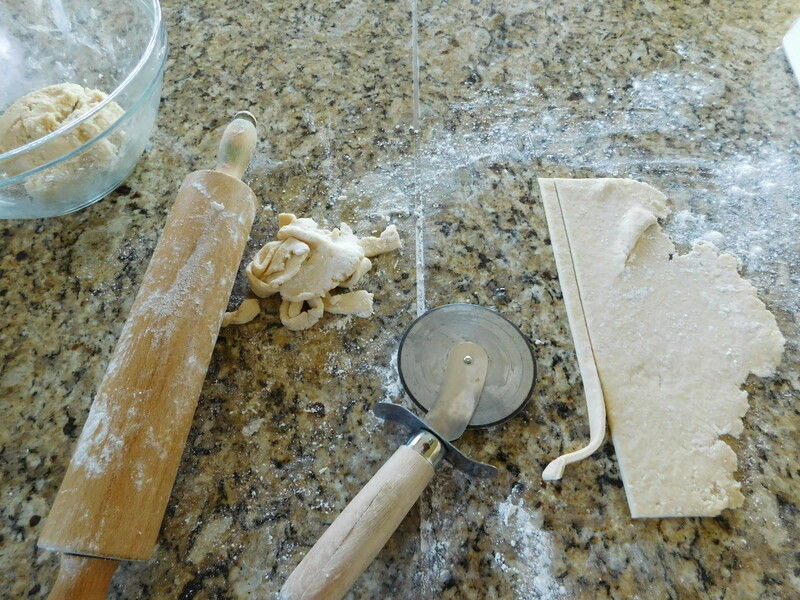 Roll out and cut long strips with a pastry wheel or sharp knife. 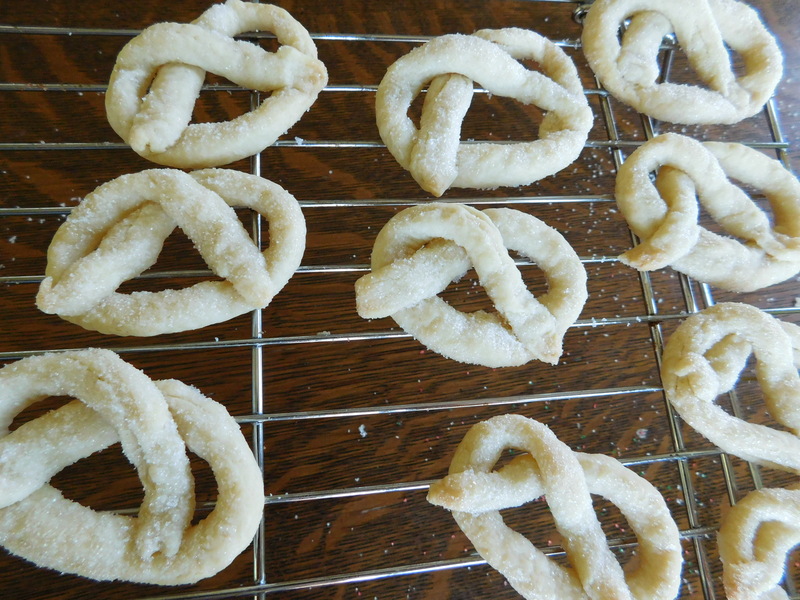 Form into pretzel shapes, dip in granulated sugar, and bake at 300-325 degrees until slightly puffy but not brown. 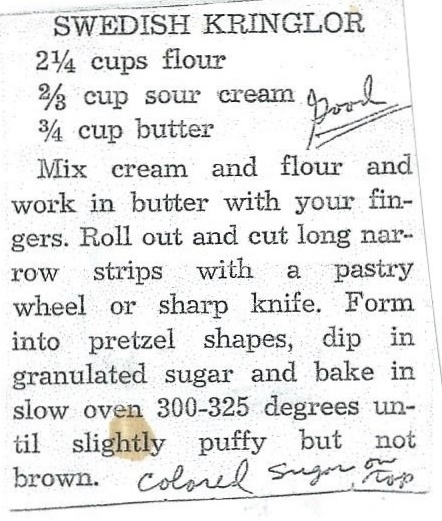 Grandma has written that she put colored sugar on top – I don’t know if that means to dip the whole cookie in the colored sugar or just sprinkle it on. I just used the granulated sugar. There sure aren’t a lot of ingredients! 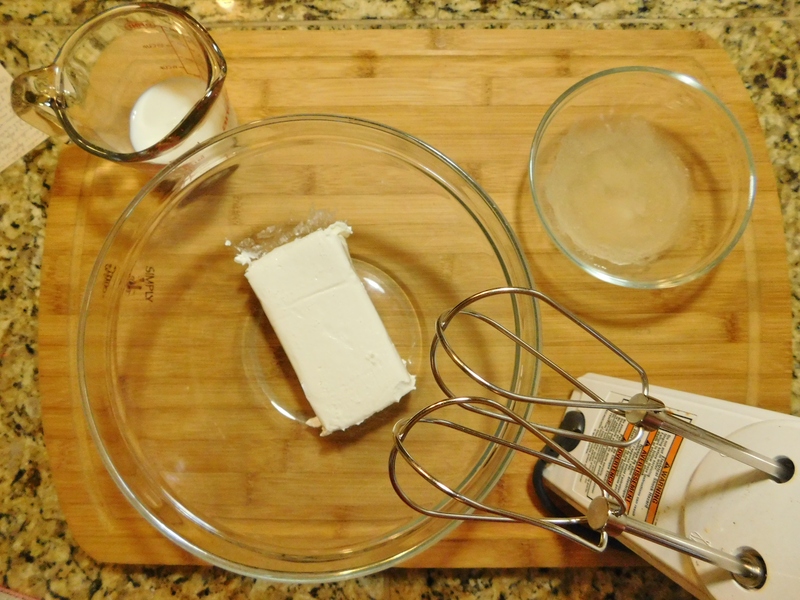 First I mixed the sour cream and flour together. It doesn’t look like much. Next, I worked in the butter with my fingers. 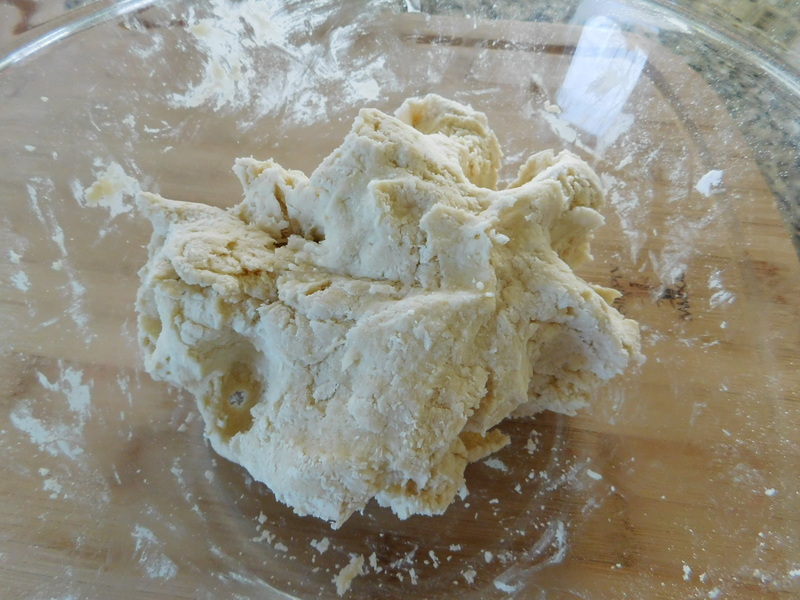 Now we have a dough. 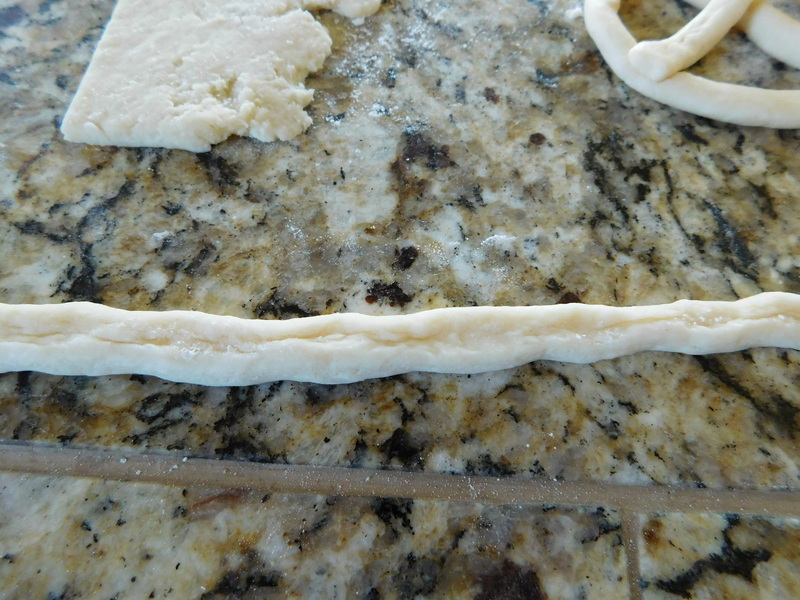 I used my pizza cutter to cut the dough into strips. 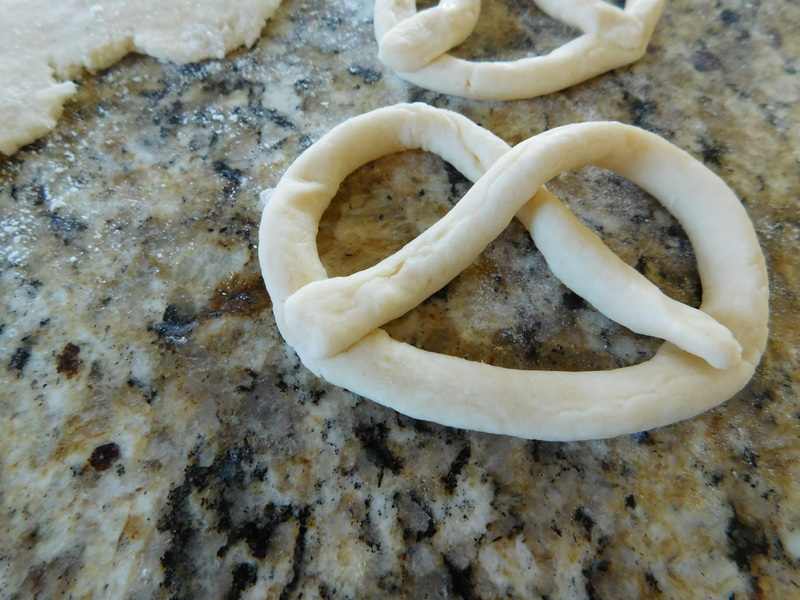 When first trying to make the pretzel shape, I left the strip flat and it didn’t look right to me, so I tried to roll the dough strip into a pencil shape like an actual pretzel. When rolling the flat strip, first I “scrunched (technical term)” the strip toward the middle and then it was easier to roll it like a snake. 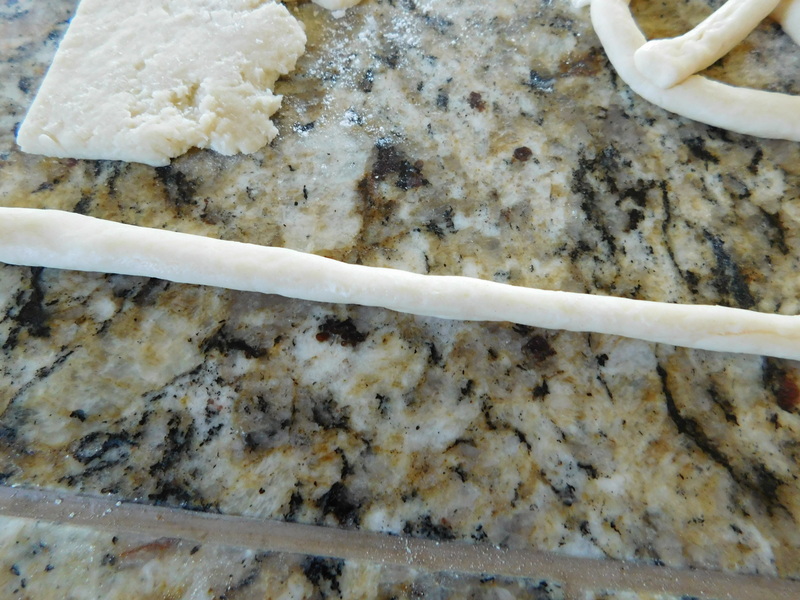 The pencil shaped dough strip seemed to work better than the flat strip. 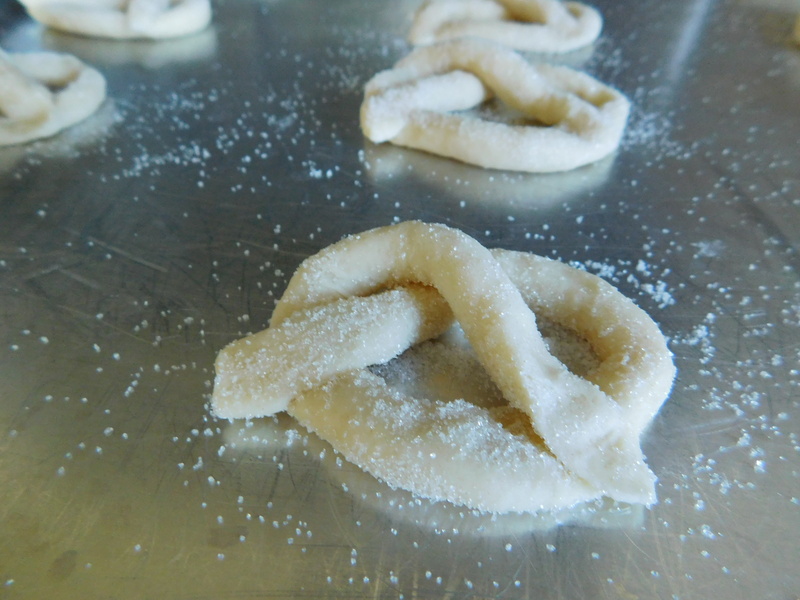 Here is the dough strip formed into a pretzel shape and dipped in granulated sugar. Most of the cookies look a little wonky. Oh well. They’re tasty and are just right for your Christmas cookie tray or for your afternoon coffee in front of the tree. Did I do these right? I really don’t know. Let me know what you think! 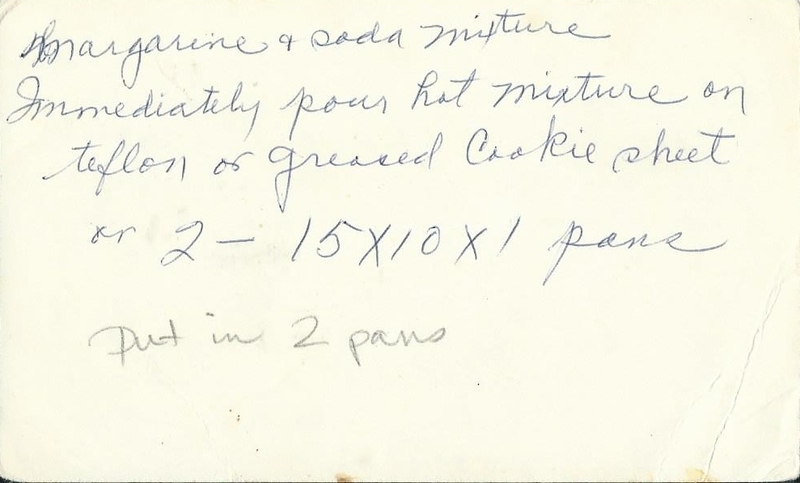 Today’s recipe comes from my other Grandma! 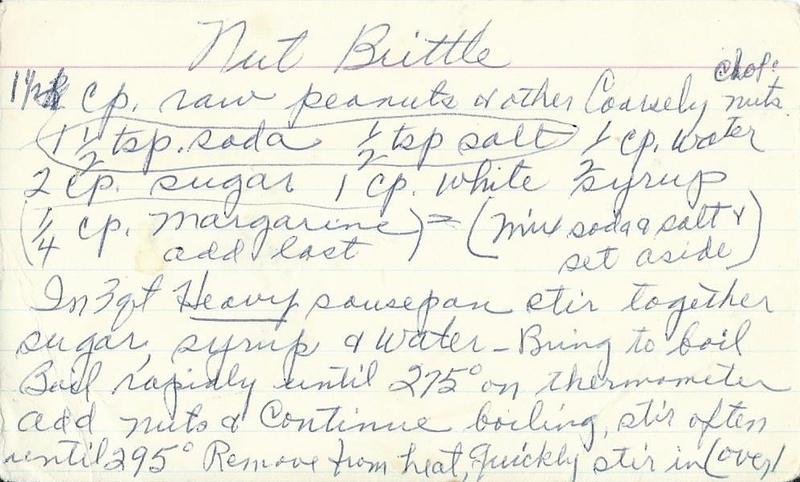 I can’t remember a Christmas growing up when she DIDN’T make this Nut Brittle. My Gramp liked candy and Grandma made him several kinds to choose from every year. She made Nut Brittle, Hard Candy, Chocolate Bon-Bons, and Fudge. Gramp would also bring home candy from work at Christmas time that you wouldn’t see at any other time of the year. That’s the beauty of growing up in a smaller town – there were people who actually made candy at Christmas time and would go around town and sell it. I remember two kinds of candy specifically – one that was white hard candy rectangle that had a black walnut filling in it, and one that was almost like sponge candy, only different. I don’t exactly know how to explain that one, but it was delicious. We spent most Christmas Eve’s with my dad’s side of the family because we had cousins to be together with on his side. 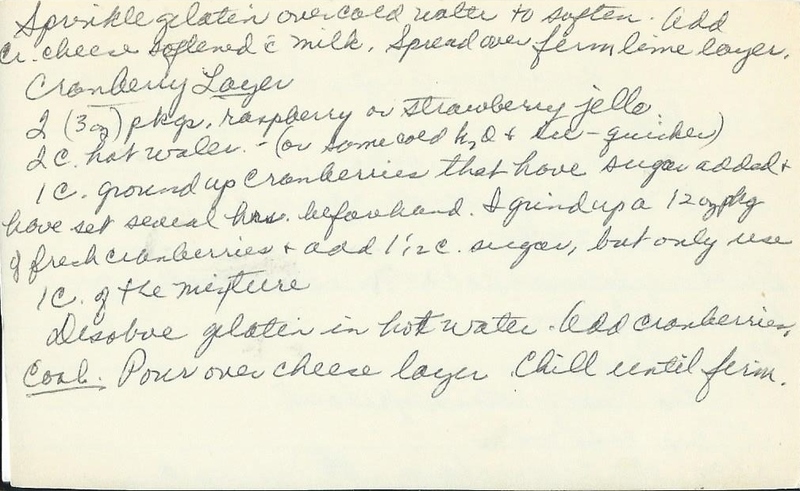 We don’t have a lot of photos of Grandma and Gramp at Christmas time, probably because she was in the kitchen most of the time – she loved to cook, too. 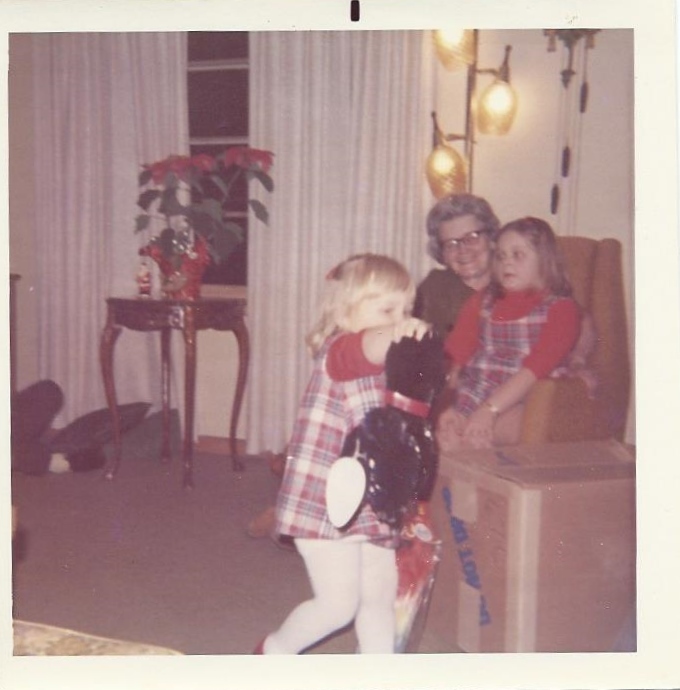 Here is one photo we do have from the early 1970’s and it’s me, my sister, and Grandma. There are those matching plaid jumpers again – and my sister must have opened a present and is really loving that puppy! Ha! Grandma must have just had her hair done (by one of her neighbors who had a salon in her basement) for the holiday – it’s looking good! I love and miss that smile of hers! 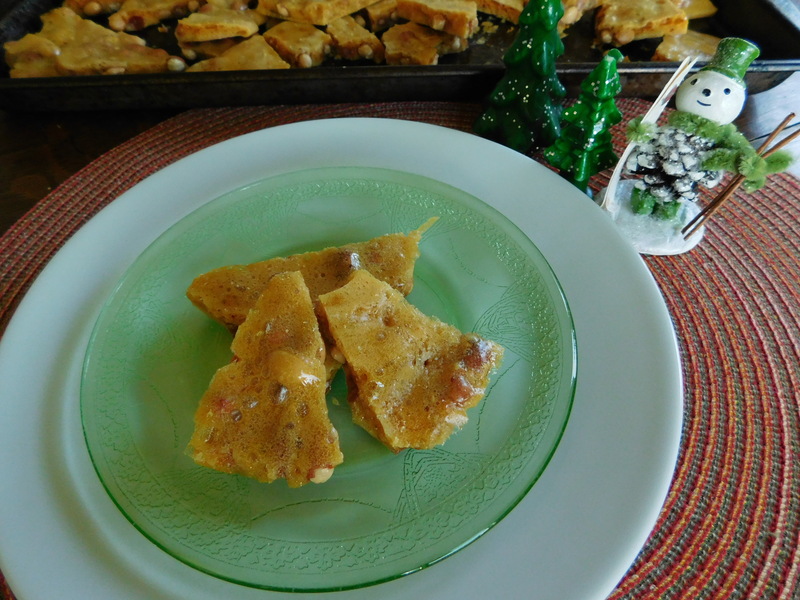 This is really a pretty easy and delicious brittle. Boil rapidly until it reaches 275 degrees. Continue boiling, stirring often, until it reaches 295 degrees. 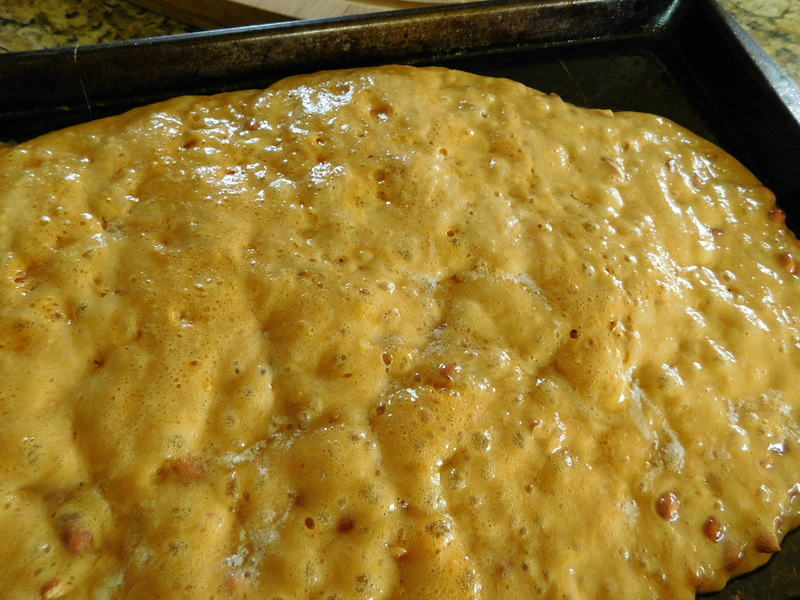 Immediately pour hot mixture onto greased baking sheet. I have also used cocktail peanuts instead of raw peanuts when making this and it seems to come out just fine. Adding the baking soda, salt, and butter turns the hot syrup into molten lava!!! 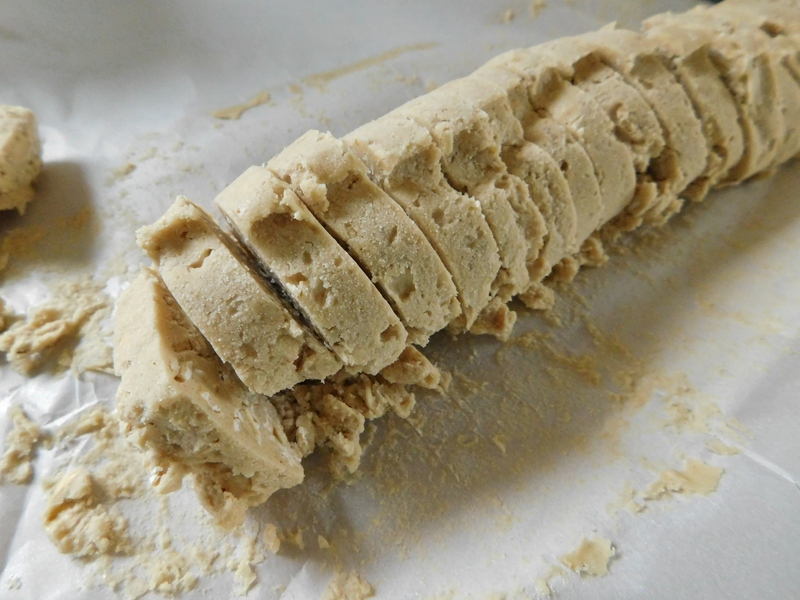 I don’t spread it once it’s on the baking sheet – I like it thicker. 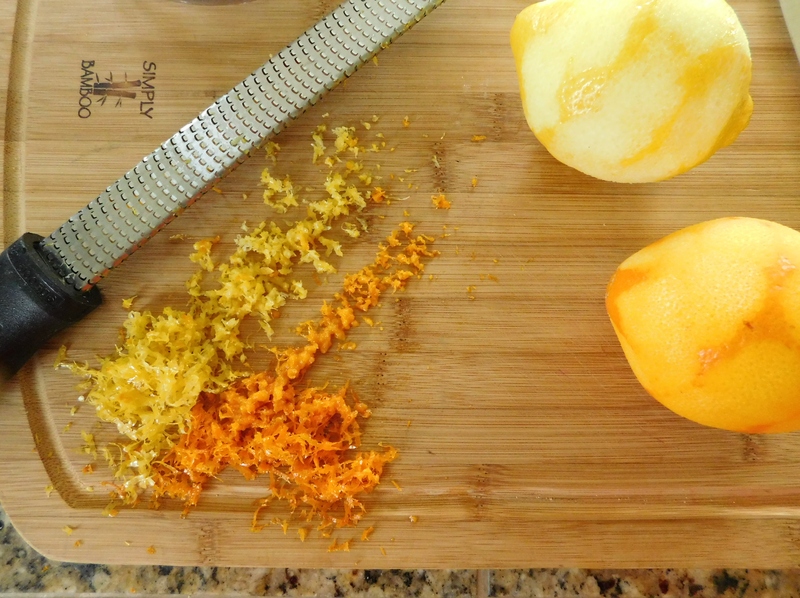 This makes a big batch – a whole baking sheet full. 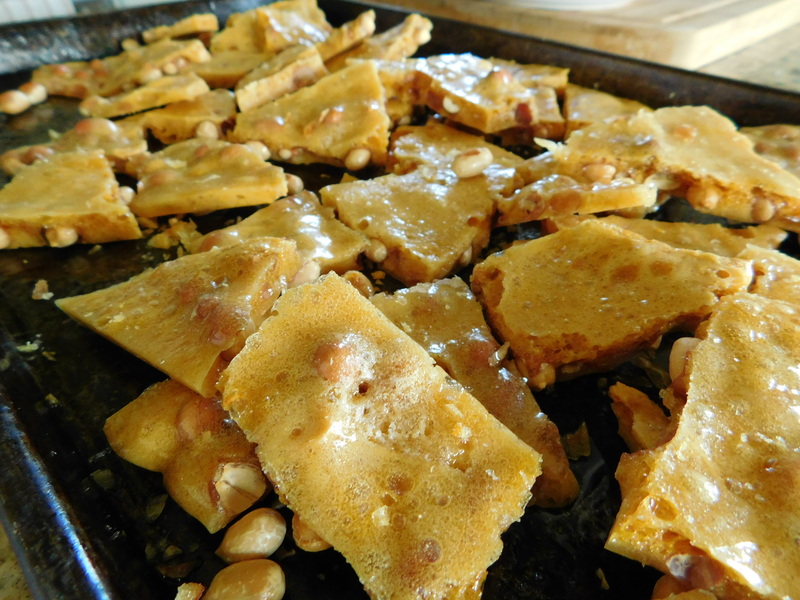 My family can never get enough peanut brittle at Christmas time. I always end up making a second batch. This recipe is really a good one. Make some for your family this year! This time of year reminds me so much of Grandma. She and Grandpa were such entertainers. They would have friends and family over all the time for dinner or dessert, especially during the holidays. I loved to go to their house for Christmas because, of course, she was a great cook, but there were also some of my favorite decorations. 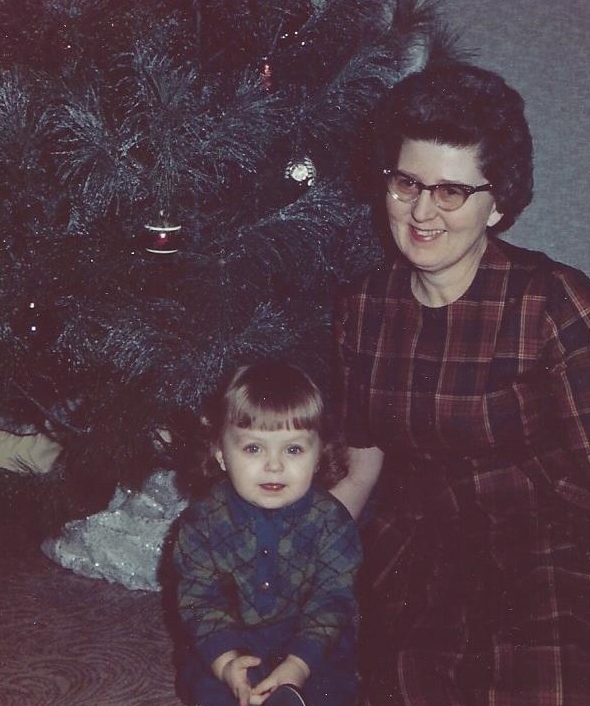 This photo of me and Grandma is from Christmas time when I was about 2. When you entered the house at the farm, you had to go through the kitchen to get into the main part of the house. To get to the living room, you had to go through the dining room where the big attraction for me was the light up plastic church. This little church looked suspiciously like the church that Grandma and Grandpa belonged to and it had (most of the time) a red bulb in it that would glow like a beacon, drawing me in to sit in front of it for hours, totally fascinated. From the dining room, you moved on to the living room and the main event – the Christmas tree with its glowing colored bulbs and antique glass ornaments. This might have been the first time they had a tree on the floor – I must have outgrown the need to have the tree up on a table! We would have a wonderful dinner in the dining room, move on to the opening of presents, and then later, inevitably, it would be my job to pass around candy or a can of mixed nuts. I still have the fascination with light up churches and buildings. My mom started my Dickens Village collection with a church for my 25th birthday and it’s grown to cover the entire top of my kitchen cupboards. I also still have an obsession for antique glass ornaments and they cover our Christmas tree. This is the Grandma I remember, with that smile of hers and her “wash and set” hair! Today’s salad recipe is a great one to use for your holiday entertaining, dinners, or even just a weeknight dinner. 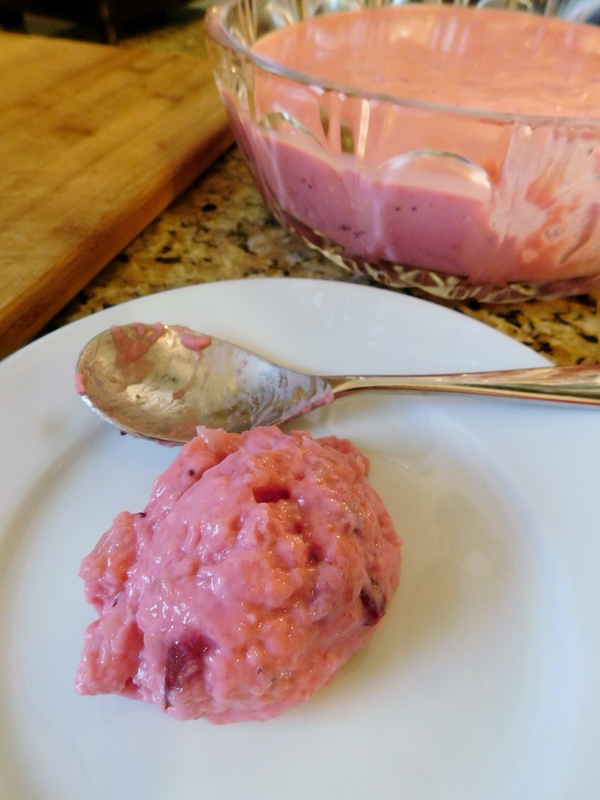 This Cranberry Mousse is a very easy and tasty salad. This is such a typical “Grandma” recipe – you can pull it together so quickly, it would be a great addition to any meal – good with your holiday turkey or ham. 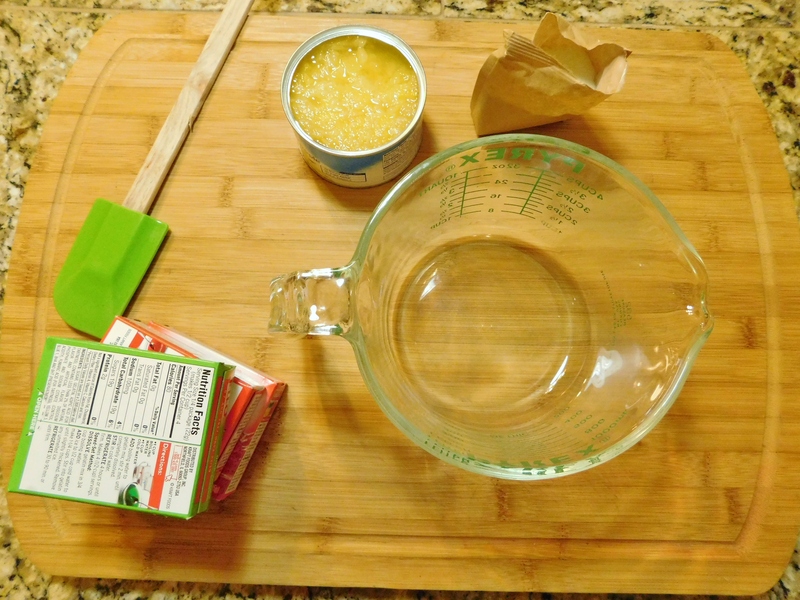 Dissolve jello, add pineapple juice. 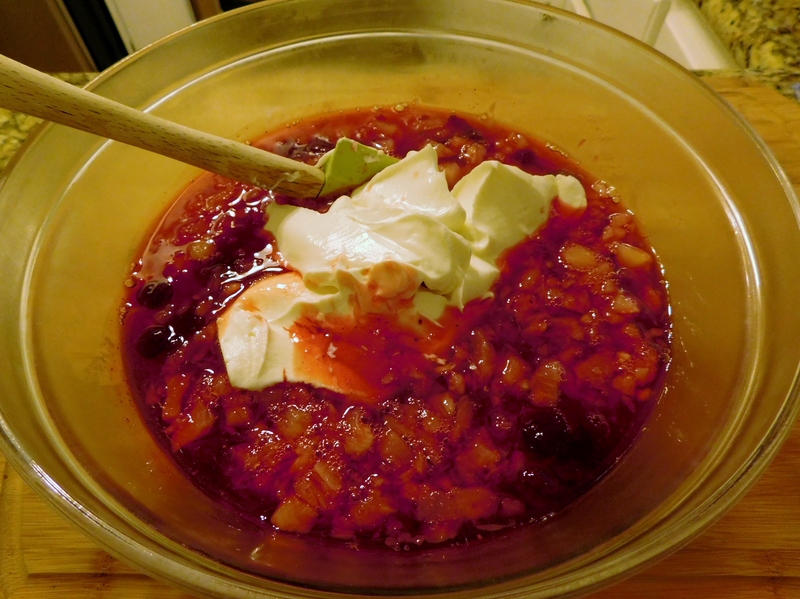 Stir in cranberry sauce, lemon juice, lemon peel, and nutmeg. 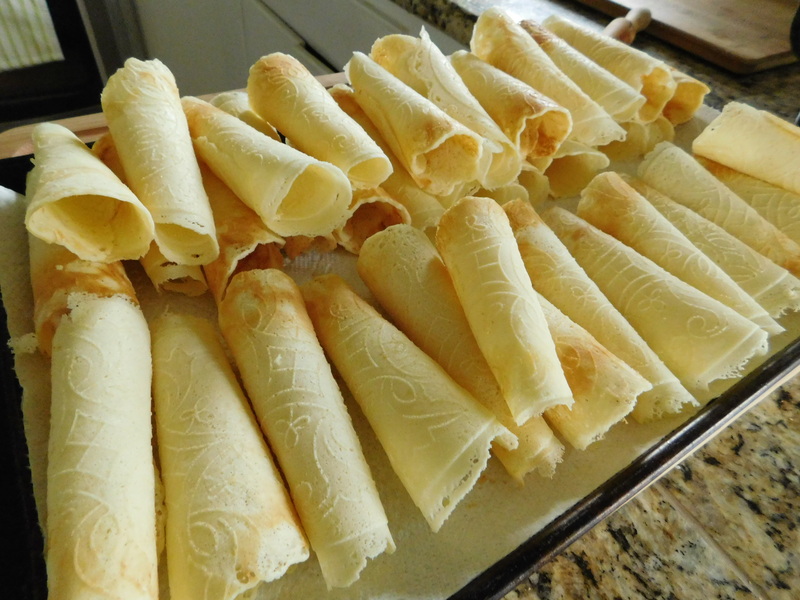 Fold in sour cream, pineapple, and nuts. 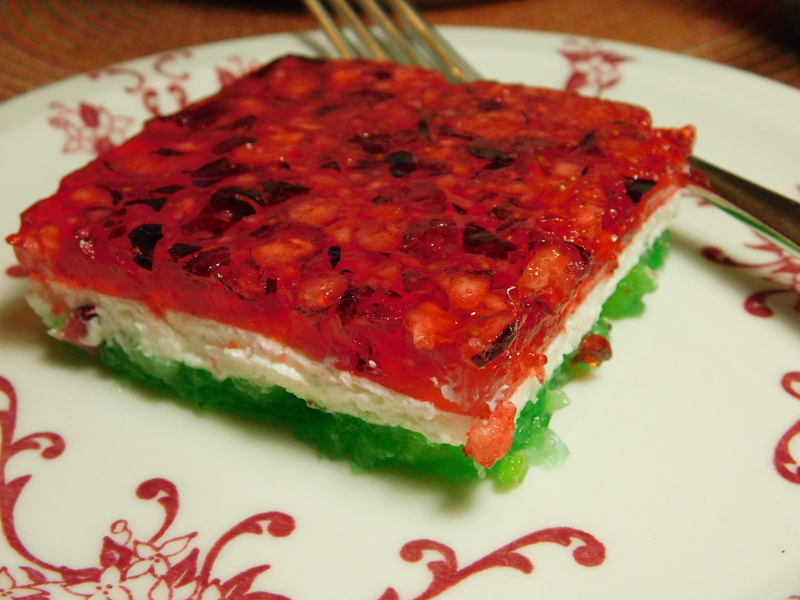 If you can make jello, you can make this salad! Mix it all up the night before and you’ll have it ready for tomorrow night’s dinner. I put this batch in my fanciest bowl! There’s just not much to say – it’s delicious and great for a weeknight dinner . . .
or a holiday dinner or buffet. So when you’re entertaining and your friends and family are coming for dinner, try this salad. It’s easy, elegant, tasty, and full of fruit – they’ll love it!